We have seen that frequency and wavelength are exclusively dependable of the metric of space. Which means that when electromagnetic radiation traverses different metric of space, its wavelength and frequency is altered. Let’s see what happens when an infrared electromagnetic radiation traverses different space metrics through and between galaxies. As we can see, depending of the intensity of “mass energy” decreasing the metric of surrounding space, the wavelength adapts to that metric. But then what happens to a gamma ray wavelength that starts already reduced to the maximum in flat space? It's evident that it cannot be more reduced by altered space metrics? The answer is that gamma rays never starts in “flat” space; because that's not where it is produced. Gamma rays are always produced in a very dense energy environment; which means in a much reduced metric of space by mass energy. The first appearance of gamma rays was around the reduced space metric of a Top quark which is the most massive particle of them all. This means that the environment of a Top quark is the most affected in its metric, by “mass energy”. This also indicates that "gravitation" is excessively important even at the level of Top quarks. Which proves that no other "interaction/force" than normal "gravitational effect" is needed to explain astrophysics, if we use density of energy instead of "temperature" to explain events. We must leave that "alchemist concept" and adopt a more advance vision of science. The space metric around a Top quark is reduced to a length just a bit bigger than the original “singularity” (10^-35 meter). So whatever the following space metric a gamma ray traverses, it always undergo an increase of its wavelength and a decrease of its frequency. Furthermore we can say that all different kinds of electromagnetic radiation have the same origin which is the gamma radiation. We must note that gamma rays are neutral. Gamma radiation (electromagnetic radiation) is one of the three types of natural radioactivity.The other two types of natural radioactivity are alpha and beta radiation, which manifest in the form of particles instead of a "quantum" of energy (photon). Being the first of the three types of natural radioactivity that appeared in the universe, it becomes the last type of radioactivity to manifest itself in a "decay" process. The chronology of a "decay process" is Beta -> Alpha -> Gamma. It also means that in “flat” space, electromagnetic radiation always has the longest wavelength and that all shortest wavelengths are impossible. But then, how is it possible that, on Earth, where a definite metric is present, we can observe all the existing electromagnetic wavelengths? And the answer is: Electromagnetic radiation doesn’t travel. Electromagnetic is everywhere, at the same time and what we can observe is the “history”, or the “evolution path” of electromagnetic, from its initial phase as a Gamma ray. We can observe it because that “history”, that “evolution path” is imprinted everywhere in the universe. But again how can that be, being everywhere at the same time? The answer to this question is rather simple. It’s everywhere at the same time because it “travels” at the speed of light and at this speed, time is “frozen” and distances are “null. To make a “fact” of all this, we can affirm that a photon doesn’t travel from one point to another; because if it did, it wouldn’t have light-speed. Note that when an electromagnetic wave traverses an "altered metric space" from "flat space", that altered metric gradually decreases toward the center of gravity. So all wavelengths exist inside the volume of "altered space" along the "path" the electromagnetic wave presents itself down to the center of gravity. That could explain why we can "observe" electromagnetic radiation in different wavelengths. The preceding drawing exposes and explains all characteristics of those two “special” particles. Furthermore, we can understand that by merging two surface particles perpendicularly one to the other, we get the structure of electromagnetic waves composed of each particle’s characteristics. Neutrinos are “surface” ½ spin particles and are always left-handed. At 10^-43 sec after time = zero, they are propelled in all directions creating “space”. The metric (length) of their diameter is the shortest length possible which prevents them to increase in size. The reason is simple; a neutrino cannot increase by any fraction of this basic metric size, since those “fractions” cannot exist. But since their inner energy is centrifugal, this obliges them to duplicate instead of increase in size. 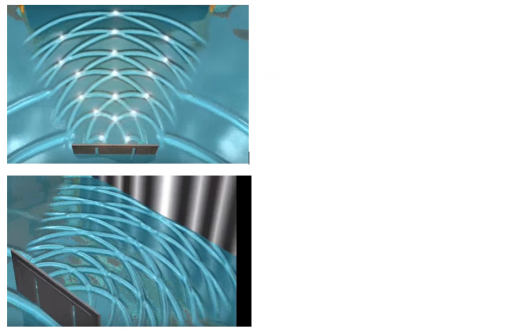 Duplication of neutrinos is manifested at almost light-speed. It is their left-handed helicity that slows them down a bit in their duplication, which provokes the definition of distances (at light-speed, distances are null) and time (at light-speed, time is “frozen”). Duplicating in “all directions” is what “creates” a three-dimensional observable space (volume). When a neutrino duplicates, the resulting neutrino starts to duplicate also; all those duplications composes a volume of space that doesn’t have a definite center. Center is everywhere in space, because it’s inside each of the neutrinos. There exists a cosmic neutrino background at a temperature of 1, 9 kelvin while the cosmic microwave background, manifested later, is at 2, 7 kelvin. The somewhat "abnormal" surplus temperature of the microwave background is because of a “reheating” period involved in its appearance. The energy of a neutrino is the total energy of expanding space and it is an invariant. The density of expanding space decreases according to the ratio of expansion; but even though density decreases, the energy stays an invariant in the “overall”; because it’s always the same amount of energy, of each neutrinos, that is present everywhere in space. Note that when you observe a single direction of those duplication, you perceive "motion". Which brings us back to Euclid's concept that a line is composed of a succession of "indivisible" points and so is a trajectory. The question that remains is: Do neutrinos duplicate only once or continuously? We might see that later on. Gluons are “surfaces” particles with full “clockwise” spin (see drawing). At 10^-36 sec they are introduced perpendicularly to expansion, in the “all directions” expanding universe, having the diameter of 10^-35 m. Their “inner” centripetal energy is greater than the “inner” energy of the neutrino. It’s equal to light-speed square, while neutrino’s is only light-speed. Like their counter part the neutrinos, gluons have each the same amount of energy. But, unlike the neutrinos, that "inner" energy will decrease gradually for each subsequent massive particles produced by radioactive decay. For example Neutron's decay produces a less massive proton by expelling a quantum of energy. Gluon possess an “inner” topology that sends everything to its center. That’s where all its “inner” energy is directed. When introduced in our universe, gluons are carried off by expansion in all directions; which disjoins each sides, one from the other, of each their surface. 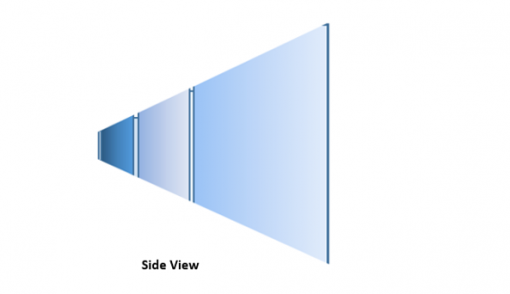 Naturally, all "front sides" are the mirror picture of its separated "back side". This event happens as soon as the gluon appears in our universe at 10^-36 sec after time = zero. Diagram 3. 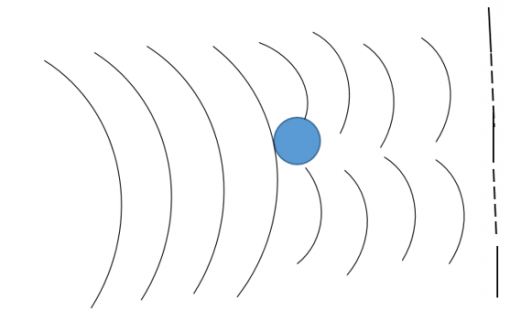 The grey ellipse is a sphere moving relativistically at a constant velocity relative to an observer (blue dot); its oblate shape, as seen from our perspective, is due to Lorentz contraction. The colored ellipse is the sphere as seen by the observer. The background curves represent a grid (in xy coordinates) that is rigidly linked to the sphere; it is shown only at one moment in time. The only difference between the standard doppler effect and the relativistic one is time dilation, so what the observer would see has to be affected by the time it takes for the image of the object to go by the observer: if his timing is slower, this image would thus appear to be longer because it would objectively take more time to go by. 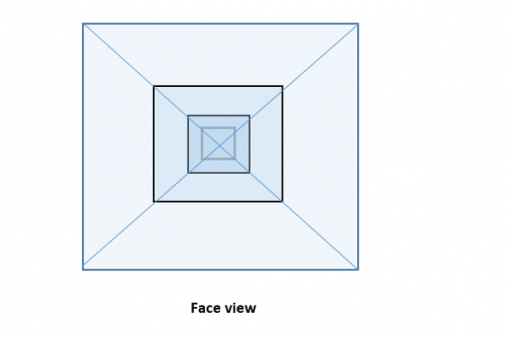 But if we apply the same reasoning to the rear image, it should also get longer, and it is not what the diagram shows, so either I am wrong or the diagram is wrong. I suspect there is anyway a problem with that diagram since I found no explanation about it anywhere. 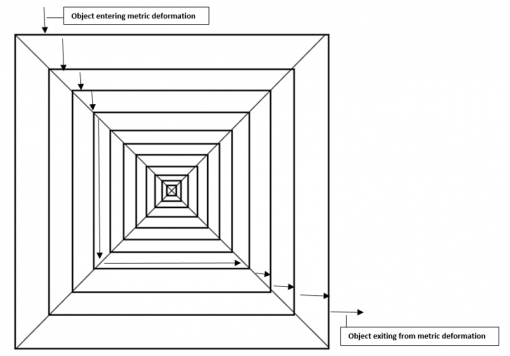 The presented diagram illustrates that the grid distortion is a relativistic optical effect, separate from the underlying Lorentz contraction which is the same for an object moving toward an observer or away. A relativistic optical effect is to me an illusion. So I didn’t bother with it too much. Reality is what is important to my mind. On the other hand, I would have to concentrate a bit to understand what is explained in that link. Furthermore I’m not sure that the subject was related to what I was explaining; so I didn’t bother bringing it up. If you find a satisfying answer, tell me! But I will also put the problem in its realistic state. What I mean is that as for now, every event that is related to the "story" of the universe is dependent of its expanding metric. So to imagine what I could see while moving at different velocity, I will have to imagine myself as "Superman" flying in space on a trajectory marked with electric poles installed at the same distance to each other, poles defining a metric of space. The next "mind experience" would be flying through a decreasing distances between poles and vice-versa. We can’t leave the nucleosynthesis period without having a good look at it. So let’s see a bit more about helium and its consequences. Helium; how was it made? We know that helium is the second element on the periodic table. The first one is hydrogen with one proton and one electron. In fact, we can say that the decay of a neutron (after 15 minutes) produces hydrogen because the ejected electron stays captured around the new proton. Beside this event, if there were free protons at the beginning of the nucleosynthesis, a proton could capture an electron and then become a hydrogen atom much before 15 minutes. So what about helium, that second produced element? Firstly, we have to know that there’s an “intermediate production phase” between the hydrogen atom and the production of helium. That phase is the capture of one or two neutrons by a hydrogen atom, which transforms it in deuterium or tritium. So the “evolution” of the first atoms was the result of merging of particles available at the time: Protons, neutrons and electrons. So these were the ingredients available to make the first helium atom. Note that the “real” first atom to exist is the deuterium; because it is the first atom to join all available ingredients in the universe of that time. Hydrogen didn’t integrate a neutron. An atom of helium-4 is made of 2 protons + 2 neutrons + 2 electrons. So, no wonder that the most numerous kind of helium in the universe is the helium-4. Afterward, producing a stable heavier atom needs to integrate a deuterium to a lighter atom; which, in the end, gives the total periodic table. With two protons, two neutrons, and two electrons, helium-4 has an overall spin of zero, making it a boson; as for, with one fewer neutron, helium-3 has an overall spin of one half, making it a fermion. We also know that after the hydrogen was “created”, having one proton + one electron, the fusion of two hydrogen element was impossible since positive proton particles repulse themselves. So a neutron had first to be introduced “between” two positive protons in order to stabilize the nucleus. Introducing a neutron produced the deuterium composed of 1 proton + 1 neutron + 1 electron. Now by fusing two deuterium atoms, we clearly get a helium-4 atom (the same condition is answered by the fusion of hydrogen and tritium). And since these elements appeared before heavier elements, it’s easy to understand that these were the processes producing helium-4. What do we know about helium-4? Helium-4 is described as a non-radioactive isotope of the element helium. But I don’t agree at all that helium-4 is an isotope since an isotope is an atom that doesn’t have the same amount of protons and neutrons; which is not the case for a helium-4 atom. Most helium-4 in the Sun and in the universe is thought to have been produced by the Big Bang, and is referred to as "primordial helium". Helium-4 makes up about one quarter of the ordinary matter in the universe with almost all of the rest being hydrogen. The total spin of the helium-4 nucleus is an integer (zero), and therefore it is a boson. Which destroys the concept of bosons being “force/interaction carriers” because helium -4 is not a “force carrier” and the universe doesn't make "concessions" as easily as people do. The nucleus of the helium-4 atom is identical to an alpha particle projected in an alpha decay process. The stability and low energy of the electron cloud of helium is responsible for helium's chemical inertness (the most extreme of all the elements), and also the lack of interaction of helium atoms with each other. The reason is that their valence orbital is “full”; meaning that it already contains two electrons and cannot contain more. Helium-4 is an unusually stable nucleus because its nucleons are arranged into complete shells. It was also formed in enormous quantities during Big Bang nucleosynthesis. Note that helium-3 is also a stable element even if it contains more protons than neutrons; but its valence orbital can contain one more electron, which permits easy chemical bounding producing compounds (molecules). The end of formation of helium-4 has left the early universe with a very similar ratio of hydrogen/helium as is observed today (3 parts hydrogen to 1 part helium-4), with nearly all the neutrons in the universe trapped in helium-4. At low temperatures (about 2.17 K), helium-4 undergoes a phase transition, a fraction of it becoming a superfluid. Such a mechanism is not available for helium-3 atoms, which are fermions. All heavier elements had to be produced afterward in stars which were hot enough (surprising note since temperature was higher when lighter elements were produced in early universe) to fuse not just hydrogen (for this produces only more helium), but to fuse helium itself. Which really means that since the temperature was lower than when helium was produced, there has to be another reason than “hot temperature” for fusing heavier elements. We will have to check this further, one day. Helium-4 makes up about 23% of the universe's ordinary matter. In fact, nearly all the ordinary matter that isn't hydrogen. Although there are nine known isotopes of helium, only helium-3 and helium-4 are stable. The process of alpha decay produces alpha particles which consist of two protons and two neutrons bound together into a particle identical to a helium-4 nucleus. Alpha particles, like helium-4 nuclei, have a net spin of zero. Due to the mechanism of their production in standard alpha radioactive decay, alpha particles generally have a kinetic energy of about 5 MeV, and a velocity in the vicinity of 5% the speed of light. The helium-4 nuclei (alpha particle) that form 9% of cosmic rays are also usually of much higher energy than those produced by nuclear decay processes, and are thus capable of being highly penetrating. According to NASA, cosmic rays therefore come equally from all directions of the sky; 90% are hydrogen nuclei; which means “protons”. The remaining 1% are heavier atoms nuclei. The mechanisms of cosmic ray production continue to be debated (so we will debate it eventually). The smallest nuclei that have to date been found to be capable of alpha emission are the lightest nuclides of tellurium (element 52), with mass numbers between 106 and 110 (with the exception of beryllium-8). In contrast to beta decay, the fundamental interactions responsible for alpha decay are a balance between the electromagnetic force and nuclear force (to me it’s gravitation). Alpha decay results from the Coulomb repulsion between the alpha particle and the rest of the nucleus, which both have a positive electric charge, but which is kept in check by the nuclear force (gravitation). In classical physics, alpha particles do not have enough energy to escape the potential well from the strong force inside the nucleus (this well involves escaping the strong force to go up one side of the well, which is followed by the electromagnetic force causing a repulsive push-off down the other side). The energy of alpha particles emitted varies, with higher energy alpha particles being emitted from larger nuclei, but most alpha particles have energies of between 3 and 7 MeV (mega-electron-volts), corresponding to extremely long and extremely short half-lives of alpha-emitting nuclides, respectively. In 2011, was detected the antimatter partner of the helium-4 nucleus, also known as the anti-alpha. Nuclear fusion converts hydrogen into helium in all stars; but this is the only reaction that takes place in stars less massive than the Sun. In stars more massive than the Sun (but less massive than about 8 solar masses), further reactions that convert helium to carbon and oxygen, take place in successive stages of stellar evolution. In the very massive stars, the reaction chain continues to produce elements like silicon up to iron. So where do come from, all the elements heavier than iron? The answer is in supernovae. In a supernova explosion, “neutron capture” reactions take place (this is not fusion), leading to the formation of heavy elements. And since this is not fusion, tell me what else than "gravitation" can capture a "neutral" neutron to join it to a nucleus? To go into technical details, there are two processes of neutron capture, called rapid process (r-process) and slow process (s-process); these lead to formation of different elements. Slow process means that it takes hundreds to thousands of years between successive neutron captures. In this situation, a seed nucleus will slowly capture neutrons, followed by beta decay transforming neutrons in protons, thus building up new heavier nuclei up to a certain critical point when it doesn’t work anymore. The s-process, while an elegant theory of nucleosynthesis, cannot explain some basic features of element abundances, as actinides elements. In the rapid process, “neutron capture” is very swift. It happens within a time much shorter than the average beta-decay half-lives. The r-process is fast enough to break past the region of alpha-instability beyond 208Pb. The stable actinides may be produced directly from a neutron-rich precursor, or from alpha-decay of even heavier elements. As an example, let’s see where uranium comes from. Uranium was produced in one or more supernovae. The main process concerned was the rapid capture of neutrons on seed nuclei at rates greater than disintegration through radioactivity. The neutron fluxes required are believed to occur during the catastrophically explosive stellar events called supernovae. Gravitational compression of iron and sudden collapse in the center of a massive star, triggers the explosive ejection of much of the star into space, together with a flood of neutrons. Once these neutrons are captured, they take about 15 minutes to transform into protons and produce new heavier elements. We can calculate the abundances of U-235 and U-238 at the time the Earth was formed. Knowing further that the production ratio of U-235 to U-238 in a supernova is about 1.65, we can calculate that if all of the uranium now in the solar system were made in a single supernova, this event must have occurred some 6.5 billion years ago. This 'single stage' is, however, an oversimplification. In fact, multiple supernovae from over 6 billion to about 200 million years ago were involved. 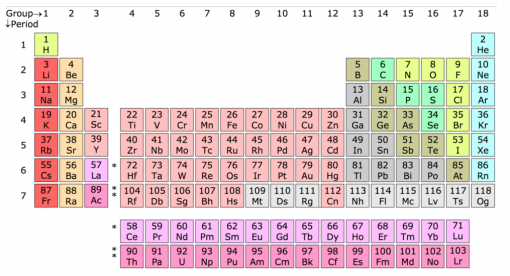 So these are all the processes that produced the natural elements of the periodic table. Once hydrogen and helium (plus a small quantity of few heavier elements) had appeared, the universe had to occupy itself in “creating” stars with what was available, before producing heavier atoms. Note that helium-3 is also a stable element even if it contains more protons than neutrons; but its valence orbital can contain one more electron, which permits easy chemical bounding producing compounds (molecules). Is completely wrong. Helium-3 has two electrons just as helium-4 and it cannot contain more; so it doesn't permit easier chemical bounding. On the other hand, having one neutron more than proton, permits emissions of different quantum of energy when fusing with other kinds of helium isotopes. Sorry about that new "blunder". If you look at the difference between a hydrogen atom and a deuterium atom, it is evident that the deuterium has more "mass" than hydrogen; which means that the "altered space" surrounding it, is more "intense" and more "expanded" than around hydrogen. The result has to be in giving it more possibility to "capture" other particles or existing elements. What we know is that it permits to capture neutrons but it doesn't permit to capture protons because of polarity repulsion (we'll have a look next at the spin of a proton). Chemical bounding wouldn't come into play unless deuterium "captures" another proton without an electron which would create an element that cannon't exist: 3 protons + 1 neutron + 1 electron; just as an element with 2 protons + 1 electron cannot exist. So chemical bounding doesn't start being possible before second valence orbital is created around a nucleus. Creating a second valence orbital is producing a "stage" between orbitals with a different energy level. It seems obvious then, that the proton of a nucleus has a relation with the energy level of the orbital stages, while the neutron hasn't. Which means that "orbital stages" are not determine by the intensity of gravitation but by a characteristic of protons. I'll have to look onto it. Andrex wrote: Is completely wrong. Helium-3 has two electrons just as helium-4 and it cannot contain more; so it doesn't permit easier chemical bounding. Means you had a doubt. Simply means you didn't check your doubt. In my previous post, I mentioned the spin of a proton while talking about the impossibility for a deuterium atom to capture an additional proton. This gives us the opportunity to address what is called: “The proton spin crisis”. This paragraph of the article brings up a lot of questions regarding “new latest scientific discoveries”. At least it does to me because it shows that scientists don’t understand what they say we cannot understand because of our lack in advance maths. 1)	Spin is not really understood. 2)	Origin of “mass” is not really known. 3)	Higgs boson isn’t the sole explication for the origin of mass. 4)	Another process gives mass to particles. 5)	The process is related to confinement. 6)	Confinement is not understood. This list makes awesome the uncertainties of scientist toward basic notions. All we read about discoveries that secures us is finally something “unknown” to everybody; if not meaning: ignorance, at least misunderstanding. On the other hand, the same list gives us indication on which “misunderstood item” we must work to solve all those problems. From what I understand, we must solve no 6, and no 1. As for Higgs boson (no 2), we already described where mass (which is kinetic energy) comes from. So the Spin is a rotation motion of constituents and b) the angular momentum is the orbiting motion of those same constituents. Let’s accept that and consider that number one is solved. Now for number 6; which is “confinement”. The answer to the confinement problem resides in the origin of quarks. Quarks are not “attached” to each other. They are attached to the center of the proton from where they originated; meaning from the singularity. Which, in fact, in the proton “space volume”, is its center of gravity. We know that the universe always uses the process that was proven efficient on previous “experiences”. So the process to “produce” quarks has to relate to the “centrifugal effect” that formerly created space. This tells us that quarks originated from the center of a gluon by “centrifugal effect”, which became the center of gravity of each quarks (remember the recoiled three-dimensional former surface split gluon). We also know that, in order to be “viable”, Up and Down quarks had to adopt one mutual point of gravity by uniting they personal center of gravity. Which is the regular process in “gravitational accretion” and thus produced neutrons or protons. But why are quarks confined inside a definite volume? a) The “active field” of a gluon is 10^-15 meter; so any resulting particle from a gluon “decay” cannot exit from that diameter’s field volume. b) When a quark erupts from the singularity, it actually “drags” gluons (which are bosons) and when the “centripetal” energy of gluons equals the “centrifugal” energy of the quark, it cannot go further. Just as if you can drag 200 pounds behind you, when taking the end of a cable, that is rolled in the middle of a parking lot, on your shoulder, you’ll be able to pull that cable from its “origin” until you have 200 pounds of cable trailing behind you; then you will not be able to go further. Those two reasons evidently explains one another; meaning that the “active field” of a gluon is definite by the volume of space needed for the equilibrium of centrifugal energy with centripetal energy inside the gluon’s field. Which means that the more the distance augments from the center (singularity), the less “centrifugal energy” is effective. This is the counter process of gravity. But it also indicate the possibilty that if you add “centrifugal energy”, the field would expand; and if you add centripetal energy, it would “collapse”. We have to remember that when the gluon appeared, it did so in a universe that was 10^-15 meter, while the gluon itself was 10^-35 meter. So the “active field” of the gluon then became 10^-15 meter because there was no added space available. Number 6 is solved. So how does all this helps solving “the proton crisis”? First. I guess we have to learn what “the proton crisis” is. “Protons have a constant spin that is an intrinsic particle property like mass or charge. Yet where this spin comes from is such a mystery it’s dubbed the “proton spin crisis. a) “Initially physicists thought a proton’s spin was the sum of the spins of its three constituent quarks. But a 1987 experiment showed that b) quarks can account for only a small portion of a proton’s spin, raising the question of where the rest arises. c) Gluons are also present inside protons. d) Gluons each have a spin of 1, so they could add up to make most of rest of the proton’s spin”. a) and b) cancel each other’s; but we must note that the same result came up regarding the sum of mass of a proton. Quarks accounted only for 1% of the total mass of a proton; the rest was accredited to the kinetic energy of gluons accompanying those quarks. So, what are the information we have regarding this spin problem? 1) “Physicists often explain spin as a particle’s rotation; In fact, spin is a quantum quantity that cannot be described in classical terms”. Which simply means that you cannot describe it, not knowing exactly what it is. 2) “Quarks also have a spin of one half”. Just as a proton has. Which doesn’t prove any cause/effect “connection” between a quark’s spin and a proton’s spin other than in its “nature”. But scientists assumed this connection. 3) “Later measurements actually suggested quarks can contribute up to 25 percent of the proton’s total spin, but that still leaves the lion’s share unaccounted for”. “Contribute” here is misleading; in fact, it strictly means that the value of a quark’s spin is equal to 25% of a proton spin. And if you add the gluon's spin, you get 125% of the proton's spin. 5) ” Gluons each have a spin of 1, and depending on which direction it is they could add up to make most of rest of the proton’s spin.” The spin of a “full” gluon is always positive (clockwise), since it has light-speed and you cannot get in front of it to “observe” its negative spinning side. But one of its mirror surface (when the “full” gluon surfaces are split) has a negative spin. This is about every information available. But let’s focus on the fact that a quark is the result of the recoil of one side surface (anti-mirror surface; the positive spin one) of a gluon as we’ve already seen previously in this discussion. Consequently negative spin protons don’t exist, because they would be antiprotons. This is where we find that a “complete” gluon has a “right-handed” (positive) spin; but a “disjoined” gluon has a right-handed spin for one of its surfaces and a “mirror spin” (left-handed) for its “mirror surface”. So regarding no 6, one “half surface” of a gluon produces a positive spinning quark. But since the original “full” spin gluon surface is split in two, the “full” spin of the gluon is split equally in two; giving ½ spin to the issued quark particle. But what can give us the right to correlate charge to spin beside the identical low % results regarding spin and mass? And since we have the habit of not mentioning “forces”, we have to relate to another previous drawing where motion glues or repels particles. In this problem of the proton, the “repel” result is not involved. So the forming of a quark by a front surface of a gluon, defines a positive spin; but since its “full” spin is split in two; we get the positive ½ spin of quark. But, again, quarks are pre-matter particles and their spin adds to themselves until positive or neutral matter particles are “created”. Once that is done, spin doesn’t add itself anymore; it simply becomes a characteristic of matter. Electrons are not really “matter”; they are “blurred” pre-matter particles. Their negative spin permits them to participate with the positive or neutral characteristic of matter particles. In fact, spin become irrelevant in the next stage of evolution containing “produced” atoms. At that evolution level, only the density of electronic energy becomes important to pursue evolution. Atoms are surrounded by negative spin electrons but that doesn’t mean at all that the electronic “cloud” around a nucleus is “spinning” negatively (or positively). But even if it does, chemical bounding is assured by the range of energy density allowed for the valence orbital of an atom. When the maximum density is attained, a new valence orbital is created allowing a larger margin of lower energy density. The maximum orbitals possible around a nucleus is 7. We explained the spin of a proton; but what about the neutron? As for a neutron, we know that it is not affected by electric fields; but it is affected by magnetic fields. Which means that it is affected by gravity (magnetism is the same effect as gravity’s). And gravity is the consequence of the positive spinning gluon topology. So, as we just saw, since one front surface gluon has a positive spin, it’s normal that neutron inherit that same positive spin, split in two, for the same reason as for ½ spin’s proton. Conclusion, quark or gluon spins don’t add to totalize the proton’s or neutron’s spin. It is simply a characteristic of pre-matter atoms; and there’s no such “crisis” as “proton spin crisis”. Since we’re not done with the evolution of the universe, let’s try to advance a bit in our story. You probably won’t believe it, but this is when the most unknown period of the story starts. So much unknown, that most scientists say that nothing important happened before 380,000 years because matter and radiation was in equilibrium. a) From 20 minutes to 47,000 years we don’t know exactly what happened. But we’ll try to find out, I promise. b) From 47,000 years to 380, 000 years, it was a “matter-dominated era” which ended by the cosmic microwave background radiation. We’ll have to try to understand what this means exactly. What does “equilibrium between matter and radiation means exactly? Mainly, it means that gravitation didn’t accrete matter to form stars yet. But, on the other hand, it’s impossible that gravitation stopped being manifested. So what could it do and what could radiation displays in regard to gravitation? To find out, we must prevent losing sight of the “overall” picture. The reality is that, what we have is a “two parts” universe; and not a universe where expansion is struggling with gravitation. And this makes a big difference. One part is standard “flat” space that simply continues to expand at light-speed, and the other part is, other distributed portions of space volumes which are not involved in the “expanding motion” process. These last portions of space are where our attention has to focus. So let’s try do describe those “non-expanding” volume of space and see what it can do. First we observe that all of those volumes of space are stable and each contains one atom. Mainly a hydrogen atom but also quite a bit, more than 25%, containing a helium-4 atom. Second, it’s evident to see that the volume of “altered” space containing hydrogen atoms are, at least, four times smaller than the volumes of “altered” space containing helium-4 atoms. And third, which is quite surprising, is if we enlarge our focus, we perceive that the volumes of containing hydrogen and helium atoms seem to be regrouped in bigger volumes of non-expanding space; as if each groups of atoms where produced by the same process in different parts of the overall expanding space. What actually happened is that a lot of pre-matter particles had previously regrouped gravitationally before even producing “atomic matter”. In fact they first "decayed" one inside the others and afterward, some joined by "gravitational effect". So we will have to keep our focus on those larger volume of “non-expanding” space. Doing so we can observe gamma rays and X-rays, going at light-speed in “flat” expanding space, being slightly diverted in their trajectory while traversing those “non-expanding” volume of space. By inspecting closer those “deviations”, we clearly find out that the wavelength of each rays changes as it enters them and comes back to its “normal” length when exiting. And since it traverses two kinds of different density of volume (the bigger one plus the one around the atoms), it reduces its wavelength twice before twice re-increasing, coming back to their normal length when they exit the bigger volume. Furthermore, each time they change wavelength, we observe that they deviate their trajectory a bit toward the atom, while approaching it, and redress it coming out of those intercalated different densities, after passing the atom. The whole event results in a different direction of their trajectory. The same process will occur much later with light rays traversing “deformed space” creating cosmic lenses. Some of those rays with their entering trajectory oriented directly toward the center of gravity of the contained atom, ram right into it infusing an addition of energy that the atom has to expel in order to stay stable. In fact, the “ramming” energy doesn’t penetrate the atom’s nucleus; it simply provokes a vibration around it that “rebounds” creating rays (emitting quanta of energy) with new wavelengths. Those new wavelengths starting with the diametrical length of the atom’s nucleus, increase while coming out of their surrounding “altered” volume of space, and start their “trek” (no, not Star trek; start trek!) in “flat” expanding space. Eventually, all kinds of wavelength will be “vibrating” through space, was it “flat” or “altered”. But at the epoch where the universe had only hydrogen and helium atoms, there was so much of those atoms that all space vibrations (electronic waves) encountered “altered” volumes of space resulting in having as much rays ramming on nucleus that there was rays produced. So even though many different wavelengths were produced, neither of them went very far. Luckily, there was a part of “flat” universe that was continuously expanding, gradually liberating more and more “flat” space between “altered” space volumes, where rays would eventually (or maybe gradually) manifest themselves. These events persisted until the universe attained the age of 47,000 years old. The problem was that the volumes of “altered” space were also getting bigger, even though they didn’t “expand” the same way as “flat” space was. Increasing volume of “altered” space probably started at this age of 47,000 years of the universe (so it is suggested). This increasing process for volume of “altered” space was the result of volumes, containing atoms, capturing one another via “gravitation effect”. When a volume of “altered” space came too close to another one (they were moving in all directions), both volumes merged, thus gaining size. When a volume containing hydrogen merged with a volume containing helium-4, the result was a 25% increased of the "altered" space volume. 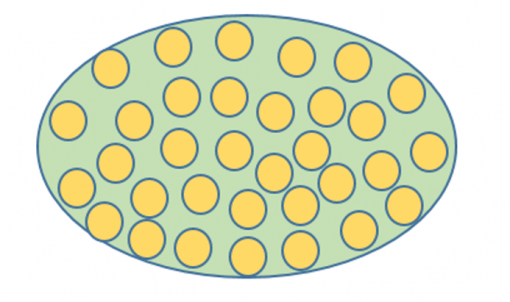 When it was two volumes containing helium-4 it resulted in a 100% increase; the same percentage was resulting when two volume of hydrogen atoms merged. This “accretion” process produced “clouds” of hydrogen and helium-4 regrouped inside enormous “altered” space volumes separated by, at least, just as big “flat” space volumes always expanding continuously. The following process continued until the number “380,000 years” appeared on the universal time clock. Clouds of atomic particles formed until “flat” space expansion overcame the “altered” space increase. At that moment, all electromagnetic wavelengths where “liberated” in free “flat” space, including the wavelengths visible to our eyes. Out of all these wavelengths, one is important to science. 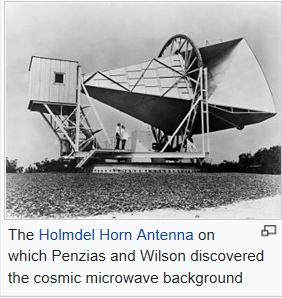 It is the microwave length; because it produces a faint cosmic background that was “captured” accidentally by searchers in 1964. 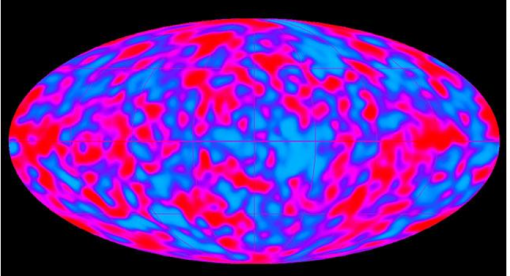 This type of radiation is what we call the “Cosmic Microwave Background”. It supplied about all the information we actually have on early universe. Scientists have taken many different “pictures” of that CMB; the last and most precise was taken with the Planck satellite. It is notable that on these "pictures", we can observe the start of a discrepancy between "flat" space and "altered" space. We can see more "blueish" (without matter) than "reddish" (with matter). This question was asked by the astronomer Heinrich Olbers in 1826. The answer is not really completely answered even today in 2017 (even if most scientists say it is). -In a “static” universe filled with stars, a dark night sky is not possible. So the actual explanation is that the sky is dark because the universe expands. Does this means that the effectiveness of our eyes depends more of the frequency than the wavelength? Geez! I don’t want to get in biology; so forget this question, please. But if this explanation was true, shorter wavelengths of ultraviolet light would also be shifted into the visible range--which doesn't happen, and the result would be even brighter. Furthermore, notwithstanding the speed of expansion, even the amount of stars in our galaxy would be sufficient to brighten the night sky. In fact, the night is brighter where stars of our galaxy stands than otherwise (the galaxy, in its star-wise distribution, has not a “bubble” shape; it has a “disk” shape). One answer seems to provide a better explanation. It lies in the fact that stars and galaxies are not infinitely long-lived. Eventually, they will dim and disappear (stop emitting visible light). “We will see this effect sooner in nearby galaxies, thanks to the shorter light-travel time. The sum of these effects is that at no time are all of the conditions for creating a bright sky fulfilled. We can never see light from stars or galaxies at all distances at the same time; either the light from the most distant objects hasn't reached us yet, or if it has, then so much time would have had to pass that nearby objects would be burned out and dark” (I don’t see the related point). This seems to explain why we cannot “see” further than CMB; it’s too far away and it’s too old. But I don’t feel it does solve the problem; because if we can “capture” microwave lengths attaining us here, which means that they “exist” here presently, on earth with our telescopes, why can’t we capture “visible” wavelengths, which should just as much exist here, with our eyes? To my point of view, the answer is not clear yet. What is clear though, is that I, once again, lost the track of the universe chronology. I’ll be back on track in my next post. So let us continue our story. -Wait a second! I've got a question. What about those intercalated volumes of “altered” space? -Yeah; so, what about them? -I implied that they are related to the “decaying” of elementary particles; but, you’re right, I didn’t describe the process with indisputable clearness. So here is the “evolution” of different “altered” spaces one inside the other. It’s evident that each level of “altered” space possess its own energetic density with the down quark’s being the less energetic. This would then be the normal structural definition of forwarding evolution. Knowing that the next evolution level is the atom, let’s first analyse an atom that has 7 electronic orbitals (shells). The electron shells are labeled K, L, M, N, O, P, and Q; or 1, 2, 3, 4, 5, 6, and 7; going from innermost shell outwards (so they must have different metrics). Electrons in outer shells have higher average energy and travel farther from the nucleus than those in inner shells. First noticeable difference in this new “structure, is that we find three additional “shells” to our previous “altered” space structure. Three “altered” space volumes are missing in our first described quark structure. There’s a simple answer to this discrepancy: Four “altered” space volume that were produced are not represented in our drawing. Our three “missing” structures are found in the volumes of “altered” space surrounding anti-particles created by Top, meaning the anti- bottom quarks. Plus the anti-charmed, anti-up quarks and anti-strange quarks. So, now, we end up with one more volume of “altered” space structure than existing in the atomic structure. Let’s explain why. Since atomic “shells” are all subjected to gravity, we have to eliminate the gluon volume from our “altered” space structure, since gluons don’t have mass and thus, don’t represent a “gravitational shell”. But we all agree that we cannot simply eliminate something from evolution. Because each stages has left its trace up until today and it has to be observed. So what would be the “trace” left by the “surface” (bi-dimensional) gluon particle? And this perpendicular position, for the extended space “surface” gluon, would be observed in the “matter” composition part of galaxies which presents a disk shaped, instead of ball shaped. Finally, we can observe that the structure of gravitational “altered” space is reproduced in the structure of atoms, whatever the components distribution in them, are. Electron shells, or energy levels like I prefer, can only contain a certain number of electrons; which are: 2, 8, 18, 32, 32, 18, 8. No known element has more than 32 electrons in any one shell. But what we see here is that the first 32 electrons shell stands at the 4th “orbiting” level, then repeats itself at the fifth level, and afterward, starts regressing until the 7th level which cannot contain more than 2 electrons, identical to the first level’s limit of 2 electrons. This defines that there is no additional orbital (shell) to the 7th valence energy level that can be added to atoms. If ever anything is added, it has to start a succeeding level of evolution. The first atom that has 4 orbital levels is Calcium (Ca) with 2 electrons in its 4th orbital; while the last atom that has 4 orbitals is Krypton (Kr) with 8 electrons in its outer level (4th). The first atom that possess 32 electrons in its 4th orbital level, is a “rare earth” atom called Ytterbium (Yb). This atom has 6 orbital levels with 8 electrons in the fifth orbital and 2 in the sixth. All the subsequent “rare earth” or other heavier atoms have 32 electrons in their 4th orbital level. The first atom that has a 7th orbital level (shell) is the Francium (Fr); with one electron in its last orbital (valence shell). The last “natural” atom produced by the universe is Uranium (U); it’s a “rare earth” atom and has: First Energy Level: 2 electrons, Second Energy Level: 8 e, Third Energy Level: 18 e, Fourth Energy Level: 32 e, Fifth Energy Level: 21 e, Sixth Energy Level: 9 e, Seventh Energy Level: 2 e.
All subsequent heavier atoms were artificially created. 5th level = moons also surrounded by a volume of “altered” space. And once again we have some missing “levels”; two, in fact. 2) Super clusters of galaxies. But I have a problem with those two additional volumes of "altered" space. The problem is that they seem to expand when I consider the space between galaxies. I do not have a solution to this problem...yet. It’s noticeable that in our own “star system”, the 4th level contains the most numerous “particles”; I’m talking about the asteroid belt. While the 5th level contains the most numerous planet’s moons of the system. Simple coincidence I’m sure. We have to admit that our evolution structure description of “altered” space that evolved since the decay of quark particles is rather exact and most precise. But what about the most curious decreasing number of electrons starting after the fifth energy level of atoms? To compare, we have to give numbers to those levels starting with the “moon level”. Then we get the galaxy level as our number five level. Which is precisely the level from which decreasing number of electron starts; meaning decreasing energetic environment starts. How can we explain it? If we look back at the decaying quarks, we find that the subsequent volumes levels of “altered” space have gradually less energy density with “distance” (in time). And since the particles involved have gradually less mass (mass energy), we can suggest that they have “more speed” (kinetic energy). Afterward, in the cosmic structure of “altered” space volumes, we find another reversing of energy density situation. It comes back to quarks decaying characteristic. The closest a planet is to the center, the most kinetic energy it has; but then, it keeps the same disposition regarding “mass energy” as in the atomic structure which increases until the fourth and fifth level than it starts decreasing until the seventh level. Quarks level = “mass energy” decreases by “decaying”; which could mean that kinetic energy increases, but as we saw in the “confinement solution, kinetic energy should also decrease. But the quark doesn’t “pull a cable” like in our explanation; it deploys more kinetic energy so the fact is that its orbital speed increases by the distance. Atoms level = “mass energy” increases (number of electrons) until the fifth level than decreases. But kinetic energy of electrons also increases by the distance since it needs energy to jump to a next level. On the other hand, it takes gradually less energy to jump from one shell to the other. The farther the shell, the less energy it takes to “leave it”. Star’s planet system = Mass energy increases by distance until the fifth level, than decreases (same as atoms). Kinetic energy should increase by the distance in regard to escaping velocity; in fact, it’s the contrary situation; speed of planets decreases by distance. But the way to look at it is that the farther from the sun, the lesser need of energy is needed for escaping velocity. So it’s the escaping velocity that decreases. This is the same as for electron’s jumps. Galaxies level. The detailed process by which early galaxies formed is an open question in astrophysics. But because scientists have to add “dark matter” to galaxies in order to justify the “too fast” orbital speed of stars farther away from the center, we can surmise that the kinetic energy of stars increase by the distance; just like electrons. We can also affirm that the farthest a star is from the center, the less energy it needs to “escape” the galaxy. This again, just like for electrons and planets. Finally, gravitation effect is the only basic effect needed to explain the structure of different levels of evolution starting from the quark level. But I didn’t explain why, starting at the fifth level of atoms, “mass energy” starts decreasing. In fact it’s like in our solar system; Jupiter, which is the most massive of our planets, is the turning point for the mass of planets. Further than Jupiter, planets are gradually less massive (except that Neptune (before last) is more massive than Uranus (last)). So I didn’t explain it, but I surely remarked it. A "stage whisper" for a change. Everybody heard of the double split experiment. As you can see with a particle instead of a slit, like in the double slit experiment, it’s the particle that cuts the wave in two. So it’s not the slits that provoke the double waves; it’s the part between the slits that cuts the original wave in two. But even so, it’s not the front part of the wave that makes the bright lines on the receiving wall; it’s the crossing points of rejoining waves that augments the energy of those points and brighten where they hit the wall. And they got the same result even if they shot single photons successively at the double slit. They, then, put a measuring instrument in front of the slits to find in which slit each photon was passing. The result on the wall changed and became only two bright lines. “The idea behind the double-slit experiment is that even if the photons are sent through the slits one at a time, there’s still a wave present to produce the interference pattern. The wave is a wave of probability, because the experiment is set up so that the scientists don’t know which of the two slits any individual photon will pass through. But if they try to find out by setting up detectors in front of each slit to determine which slit the photon really goes through, the interference pattern doesn’t show up at all. The reason cannot be other that: Because now they know were photons go through. This is true even if they try setting up the detectors behind the slits. No matter what the scientists do, if they try anything to observe the photons, the interference pattern fails to emerge. It gets even weirder than that. A group of scientists tried a variation on the double slit experiment, called the delayed choice experiment. The scientists placed a special crystal at each slit. The crystal splits any incoming photons into a pair of identical photons. One photon from this pair should go on to create the standard interference pattern, while the other travels to a detector. Perhaps with this setup, physicists might successfully find a way to observe the logic-defying behavior of photons. But it still doesn’t work. And here’s the really weird part: It doesn’t work regardless of when that detection happens. Even if the second photon is detected after the first photon hits the screen, it still ruins the interference pattern. This means that observing a photon can change events that have already happened. Maybe someone will someday. But maybe, also, would it be simpler to solve if all were conscious that photons have light-speed and that, at light-speed distances are null and time is frozen. Which means that, for a photon, “before” and “after” don’t exist; everything happens at the “present” time. We can also say that a photon does not “travel”; it experiences all things possible at the same time; which means that it gives all possible results involved in the event. So, before going through the slits and hitting the wall, all results possible happen at the same time for a photon; and a “wave broken” result is a possibility just as much as a particle result, for the photon. So both possible results (wave-like and particle-like) happen at the same time on the wall and produces multi bright lines. On the other hand, if someone “observes” which slit the photon passes through, the “wave result” possibility is thus eliminated, because it’s the particle-like event that is observed. Then, only the result in regard to a particle is possible; and that result is two lines on the wall. The real conclusion becomes that if you observe a wave-like event, you get wave-like results; if you observe particle-like event, you get a particle-like result. So tell me: What’s so weird about that? So we were at the date of 380,000 years after the Big bang. The following evolution time lap lasted until around 150 million years later. During this period, stars and galaxies didn’t exist yet. On the other hand, there’s no doubt that gravitation was keeping its good work. At the 380,000th years of the universe’s existence, officially, temperature becomes cool enough (around 3000 K) for the protons to capture negatively charged electrons, forming neutral hydrogen atoms. Helium atoms formed somewhat earlier due to their larger binding energy; which means that they had more intense “gravitational effect” because they were more “massive”; or, like I prefer to say: they had more “mass energy”. Once nearly all the charged particles were bound in neutral atoms, the photons no longer interacted with them and were free to propagate for the next 13.8 billion years. As we can see here, the “official” story manages the chronology very badly. It’s evident that hydrogen and helium atoms existed before this date; and it is also evident that the binding energy they talk about is simply ordinary “gravitational effect”. So let’s skip the “temperature effect" analysis and keep to “causes” like density and “mass energy” (gravitation). So “hydrogen dust cloud” had started forming and thus, liberated electronic wave “vibrations” between them. The result was the Cosmic Microwave Background. On the CMB (top image of this post) the red parts are where the “dust clouds”, we’re talking about, are; the blue part are "flat" space. Inside those “hydrogen dust clouds”, some atoms started to “accrete” faster than others; so the volume of their overall surrounding “altered” space increased faster than other atoms, permitting them to “regroup” even more hydrogen atoms. I say “regroup” because the “mass energy” possessed by hydrogen atoms was not intense enough to “fuse” atoms yet; so it resulted in simply regrouping atoms together, forming “clusters” of hydrogen atoms with some helium-4 atoms intermixed with them. So, inside those non-expanding “dust clouds” distributed in the expanding "flat" universe, regrouping of atoms was proceeding everywhere, diluting the number of loose hydrogen atoms between the forming clusters. Then, as we know, since helium-4 atoms has four times more mass energy than hydrogen atoms, they started to impose they superiority and began capturing as much hydrogen atoms as they could (a few heavier elements were also present and were even more effective). 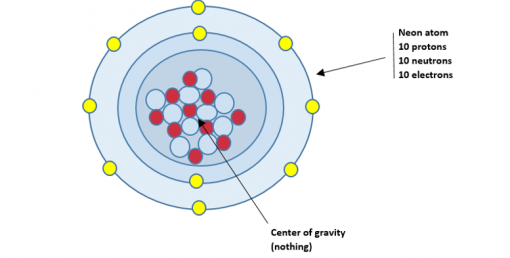 Those helium-4 atoms became the center of gravity of “accreting” hydrogen atoms; and the more the center of gravity of each atoms merged with this center of gravity of the helium-4 atom, the more the gravitational effect made hydrogen atom push forward to attain that center of gravity. The pressure was increasing continuously on their center of gravity because of gradual accretion of hydrogen atoms. It finally came to the "pressure point" where fusion of hydrogen atoms became possible at this center; and so, was the first generation of stars born. As we can see it is difficult to say if stars came before galaxies or galaxies before galaxy clusters because it was an almost simultaneous process that produced them, even though it lasted at least 150 million years. From Planck satellite we know that the first generation of stars appeared 200 million years after the Big bang. Incidentally, the same process is still going on today. -Pardon me; but did you say “reionization”? The light emitted by the first generation of stars split neutral atoms apart, turning them back into their constituent particles: electrons and protons. The universe reverted from being neutral, to once again being an ionized plasma. It did not take long for most material in the Universe to become completely ionised, and – except in a very few, isolated places – it has been like that ever since. -Sorry; but that would mean that atoms are not “neutral” anymore; something of which I doubt greatly. The fact is that there are neutral atoms and there are isotopes; both exist. So, I’m sorry to say that the whole universe was not “ionized” because then, normal “neutral” atoms wouldn’t exist. This official reionization period came into the minds of scientist because they consider temperature instead of density; so they imply the thermal ionization they observe in thermal experiences. I’m not saying it didn’t happen; I’m saying that if it did, it didn’t involve the whole universe because neutral atoms do exist and furthermore, they are the “normal” atom existing. But let’s check the known results obtained. a) A first estimate of the epoch of reionization came in 2003 from NASA's Wilkinson Microwave Anisotropy Probe (WMAP), suggesting that this process might have started early in cosmic history, when the Universe was only a couple of hundred million years old. b) This first estimate was soon to be corrected, as subsequent data from WMAP pushed the starting time to later epochs, indicating that the Universe had not been significantly reionized until at least some 450 million years into its history. 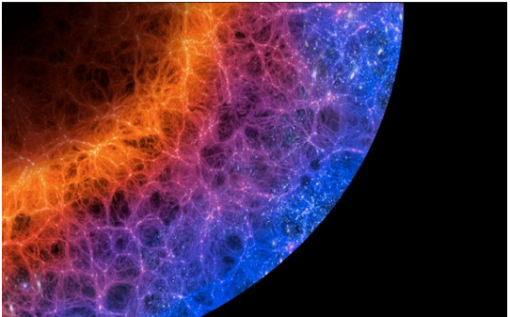 c) In 2015, the Planck Collaboration provided new data to tackle the problem, moving the reionization epoch even later in cosmic history and revealing that this process was about half-way through when the Universe was around 550 million years old. d) Now, a new analysis of data from Planck's other detector, the High-Frequency Instrument (HFI), which is more sensitive to this phenomenon than any other so far, shows that reionization started even later – much later than any previous data have suggested. “…starting fairly late in cosmic history and having half reionized the Universe by the time it was about 700 million years old. … "We have also confirmed that no other agents are needed, besides the first stars, to reionise the Universe," adds Matthieu Tristram, a Planck Collaboration scientist at Laboratoire de l'Accélérateur Linéaire in Orsay, France. e) The new study locates the formation of the first stars much later than previously thought on the cosmic timeline. The undeniable fact is that the Hubble telescope has photographed very early galaxies formed with stars. GN-z11 is a high-redshift galaxy found in the constellation Ursa Major. GN-z11 is currently the oldest and most distant known galaxy in the observable universe. It existed 13.4 billion years ago, just 400 million years after the Big Bang. Which means shortly after, but "very close to the end of the so-called Dark Ages of the universe", and "near the very beginning" of the reionization era. With a stellar age estimated at 40 million years, it appears the galaxy formed its stars relatively rapidly. The fact that a galaxy so massive existed so soon after the first stars started to form is a challenge to some current theoretical models of the formation of galaxies. So the stars of that galaxy started to form 40 million years before that 400 million years. Which brings us to 360 million years after the Big bang for those star formations inside already formed dust clusters. Nothing says that this is the oldest galaxy that we will ever observe though. Swiss scientists may have found the answer to a troubling mystery about the early evolution of our universe. After the Big Bang, the universe cooled down for a billion years in a kind of cosmic Dark Age. But then it mysteriously reheated. Electrons and protons that had been happily joined in hydrogen atoms were ripped apart again during a period known as the “cosmic reionization.” What could have done this? Regarding green pea galaxies, no one knew these galaxies existed until 2007. Since then, scientists have discovered that the Green Peas are aggressive star-forming galaxies, which means they are a source of high-energy ultraviolet radiation. Ultraviolet radiation is thought to have driven the reionization, but most star-forming galaxies reabsorb too much of that light to be useful for studying the process. While most galaxies are more red or blue in color, Peas' striking green color comes from strong oxygen emission. -So forget them as being formed of first generation of stars since oxygen didn’t exist before those first stars exploded. Furthermore, if they are the cause of reionization, this event didn’t occur before at least the second generation of stars. So…where do you want me to get acceptable information? So gravitational effect made the center of accreted hydrogen atoms begin nuclear fusion and produces a star. From this moment on, official information is generally reliable. And the main reason is that they are most partly based on "gravitation". Initially the energy is generated by the fusion of hydrogen atoms at the core of the main-sequence star. Later, as the preponderance of atoms at the core becomes helium( meaning there’s already fusion happening) stars begin to fuse hydrogen along a spherical shell surrounding the core (Meaning that the limit pressure needed for fusion was gradually augmenting toward the circumference of the star). This process causes the star to gradually grow in size, passing through the sub-giant stage until it reaches the red giant phase. But it’s possible that first generation of stars formed too rapidly and gained so much mass energy that they produced heavy elements up to iron and then exploded sending those elements in space. Stars with at least half the mass of the Sun begin to generate energy through the fusion of helium at their core, whereas more-massive stars fuse heavier elements along a series of concentric shells (naturally depending of the pressure in regard to the distance from the center of gravity). Once a star like the Sun has exhausted its nuclear fuel, its core collapses into a dense white dwarf and the outer layers are expelled as a planetary nebula. Stars with around ten or more times the mass of the Sun can explode in a supernova as their inert iron cores collapse into an extremely dense neutron star or black hole. Although the universe is not actually old enough for any of the smallest red dwarfs to have reached the end of their lives, stellar models suggest they will slowly become brighter and hotter before running out of hydrogen fuel and becoming low-mass white dwarfs. It is very possible that the first stars were the result of collapsing hydrogen which, when exploding projected in space heavier elements (up to iron) they had create within themselves. Their destruction suggests that no galactic high-mass Population III stars should be observable. None have been discovered. Stars too massive to produce pair-instability supernovae would have collapsed into black holes. As subsequent generations of stars were born, they became more metal-enriched, since the gaseous clouds from which they formed received the metal-rich dust manufactured by the previous generation. When those population II stars died, they ejected metal-enriched material to the interstellar medium via planetary nebulae and supernovae, enriching further the nebulae out of which the newer population I stars formed (as we can see scientists use both terms "population" and "generation" stars which "blur" quite a bit there explanations). This is the moment we reach the today's part of the universe story. And we can understand that we have a lot to observe and try to comprehend. Oh; by the way. I don't know if you noted it; but we didn't have to use any "magical forces" or "undetectable matter" to go through this story of the evolution of our universe. Once again, let’s be clear about natural causes being responsible for the evolution of the universe. Nothing has to be exceptionally complicated to understand it. Here, for example; what did produced the Cosmic Microwave Background explained by photons being able to travel freely because of the coupling of protons and electrons, forming neutral hydrogen atoms; which, afterward brought the obligation to “re-ionize” them? As we saw previously, hydrogen atoms and helium were existing since quite a long time at this moment, forming “hydrogen dust clouds” clusters. Each small brownish circles in the drawing here, are dust clouds clusters distributed in the “all existing space” expanded universe at the time (There’s no space at all around this volume. Nothing else exists beside this volume). As we can easily observe, whatever electromagnetic “vibrations” (rays or waves), manifested in this volume of space, has no possibility to travel “freely” in a so much dense matter distribution. They are blocked whatever direction they adopt. But what happens when, afterward, expansion of “flat” space had been “creating” more and more “free flat” space, because the expansion of their volume was occurring faster than whatever “massive clouds” volumes? It’s easy to see that electromagnetic “vibrations” (waves or rays or massless particles) can now go through space without any more significant obstruction. Evidently, it was not the production of hydrogen that freed photons; it was simply the decreasing density distribution of hydrogen cloud clusters. It’s nice for us to make scenarios but it’s more fascinating to see the universe make its own, by itself. Like everything else, there was no need more than expansion and “gravitational effect” to produce CMB, 380,000 years after the Big bang. As for "light traveling", before the universe was one light second of diameter, light didn't travel; it was everywhere at the same second. Ever since the universe has been bigger, we have the impression that light travels. The fact is that "light speed" erases distances and the flowing of time (which is also a distance). So everywhere at the same moment is the "massless" particle's universe. But not ours, evidently; and it's not nearly soon to be, observing the weight/mass increasing of individuals in our society. Why do people have problems with science? It’s not because it is a mystery or because people are dumb; it’s because its basic subjects are badly defined. Matter is defined as anything that takes up space and has mass. -Here, “having mass” cannot mean being a “volume of matter”, since it’s the volume that takes place; so “mass” is something else which is not clear. Particles of matter have size and take up space. -This defines nothing; since size is the volume of space you take. At the very least, all matter has three dimensions: length, width and height. They all take up space. -Wrong! All three “together”, they take space; any two of them take a surface, which is not "space"; and any single of them takes an invisible position like, for example, a width without length and height; which is not "space" either. Mass is a property of matter that indicates its resistance to acceleration. -So since we cannot accelerate a photon, it means photons have mass. –No it means that the definition is wrong. The amount of mass per unit volume of an object or material is called its density. That is how much mass is stuffed into a given volume. -Which means how much “resistance to acceleration” it contains. What does it look like? How does it work? Antimatter particles have the same mass as their corresponding subatomic particles, except that they have the opposite electrical charge and sometimes opposite spin. -So it’s anti-mass; no? And “anti-mass” should be “anti-resistance to acceleration”; which means: “propulsion”; which, in turn, means “kinetic energy”; no? -but has “neutral charge” which means that all its “inner” charges balance themselves. These particles are still matter. -Wrong. They’re anti-matter. Otherwise matter is anti-matter and positive is negative. Who could base a science on those kinds of information? How can people understand what “space” is if they cannot be conscious of what “matter” is? How can they understand what is “something”, if they cannot be conscious of what is “nothing”; meaning: His “zero” something or is it an “absence of anything”? Defining “basics” clearly, and eliminating “blur”, is the most important thing to do before research; otherwise you don’t know what you’re looking for, and you find what you want to find and not "what is". “The farther the shell, the less energy it takes to “leave it”. Let’s look at the whole picture again. OK. So we have a nucleus surrounded by three electronic shells. Saying: “it takes more energy to leave the inner shell than to leave the second shell, and the second to leave the third shell”, is true when you take the nucleus as the reference point. But when we consider each shells by themselves, we find that it takes less energy to leave the outer shell than the “middle” shell . And it takes less energy to leave the second shell than leaving the first “inner” shell. Which made us conclude that, the farther is the shell from the nucleus, the less energy it takes to leave that shell. This means that when you take the nucleus as the reference point, you relate to considering the energy needed to leave the global “altered space” surrounding the nucleus. Now let’s compare to our solar system. It’s obvious that you will need more energy to “leave” Mercury’s orbit outwardly, than to leave Venus’s orbit; because you are closer to the sun on Mercury’s orbit than on Venus’s. And it would be easier to leave Venus’s orbit than leave Mercury’s orbit because you are farther from the sun; and so on from Earth, Mars and following. But is that a “fact”? We must add another “reality” to this basic “fact”. This other reality is that there are other centers of gravity involved in our solar system; contrary to the electrons orbiting a nucleus. And that makes a big difference. The difference resides in the fact that it’s not an electron “particle” that orbits the nucleus; it’s an “electron cloud” that simply surrounds the nucleus. And that “electron cloud” is not made of a “bunch” of small electrons; it’s a single electron that doesn’t have a definite “volume” except an “energical volume”. In other words, it is "energy" but it's not "matter". It's something in between "pre-matter" like quarks, and "matter" like atom nuclei. The reason we “observe” more than one electron around a nucleus is only because we give an energy value to a “basic” electron. The “reality” is that it’s always one single electron (cloud), with its own definite “energical value”, that surrounds the nucleus. In other words, it’s one single “quanta of electronic energy” that is “captured” by the gravitational effect of the nucleus. So the reason for having multiple energy levels can, then, only be because this “gravitational effect” is composed and manifested by “corridor levels” at definite distances from the nucleus. And this brings us back to the structure inside a volume of “altered space”. This would mean that there can be only 7 “energical values” to an electron cloud, determined by “altered space corridor levels”. And these “energical clouds” surround the nucleus in regard to their own “personal” energic values corresponding to a definite corridor level energical value. But if this is true, then it’s very weird that, after the fifth shell, we observe the number of electrons decreasing; which means “decreasing energy intensity”. 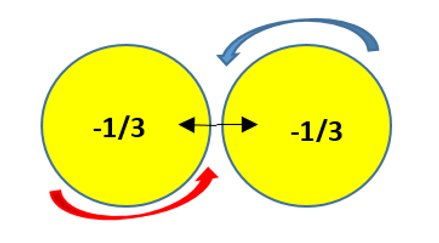 Furthermore, even with this decreasing energy value (decreased number of electrons), it still needs added energy to transfer from the “sixth” shell to the “seventh” shell of an atom. This is the weirdest thing I’ve met so far. I guess that the answer might be found in the characteristics of “sub-shells” within shells, described by researchers. This should be an interesting investigation. There has to be a difference between the first two shells and the last two ones in regard to energy value, even though there doesn't seem to have. But let’s come back to our solar system and add the “matter particles” (planets) in orbit, to verify the energy needed to leave the sun’s gravitational effect. When we consider the center of gravity of each planet (single particle) orbiting the sun, we find that, to leave the planet, let’s take Earth for example, we start a lot closer to its own center of gravity than to the center of gravity of the Sun. So we need a lot more energy to escape the planet’s center of gravity, than what is needed to escape the Sun’s gravity. This “fact” makes the energy deployment to leave the Sun’s gravity irrelevant, since this amount of energy is already deployed to leave the Earth. On the other hand, if we consider the “mass energy” of the Sun in regard to Mercury’s orbit, we must ask ourselves if the energy needed to escape Mercury’s gravity (which is a lot less than Earth’s) would suffice to leave the planet’s soil. In other words, would the energy to leave the Sun’s gravity still be irrelevant when leaving Mercury’s surface? 2)	No it isn’t. Which means that we would need more energy to leave Mercury’s surface than its “mass energy” would normally ask for. But to me, neither of those answers seems to represent the facts we observe in reality. For the simple reason that the Sun’s “gravitational effect” results from its possession of 99% of the “mass energy” attributed to the whole solar system. So normally, it should be the energy needed to leave any planet that would be irrelevant in regard to escaping the Sun’s gravity. How can the contrary be explained? I can see only one possibility. It’s that when we are inside the “altered space” of a definite center of gravity, we are “confined” inside its volume; and we are not subjected to whatever influence outside this “confinement”. If this is exact, then we have a lot to think about the “reality” resulting from “entropy”. Would the universe take measures to “protect” whatever evolved stage it attains? It is a difficult conclusion to accept because if it does, it has to be simply and logically explained. But, the fact is, when I observe passed evolution stages, I am almost required to admit it. Now, would you like a proof regarding that "protective" confinement? It's not easier to leave the Earth toward the Sun than toward open space. Which means it's not easier to "fall" toward the Sun than to "pull away" from it. If that is not weird, I wonder what can be? Oh! And by the way, this proof might seem a lot weirder to a lot of you, if you think of it. Because, if gravity was "universal", there's no way you could leave the surface of mercury near our Sun that possess 99% of the solar system's mass. Which unquestionably proves that gravity is local and not universal. So forget "critical density" versus expansion of the universe. It doesn't apply because it doesn't exist. You can also study the need for "dark matter" by the same occasion. I did already. On the other hand, everything gets simpler when we consider it all, in view of "decreasing or increasing metric"; because it's very normal that identical metric have identical results or whatever you decide to observe and compare. A define metric is always the same whatever its situation. Speaking of decreasing and increasing metric of space, when we looked at the expanding electromagnetic wavelength, we found that it didn’t decrease its energy while expanding. But we didn't talk about the "speed" of the wave. So let's do it. But since a "speed" is a definite metric-length versus a definite time period, we will use the term "celerity" instead of "speed", since expansion changes the metric-length. So, what we've concluded regarding frequency and wavelength, also means that whatever the density, the energy of expansion is invariant; which means that expansion progresses at the same “speed” (in fact the same celerity) whatever the metric. Now let’s say we use a metric of 100 miles as a basic metric-length, and an hour for a basic time period, and define the speed of expansion at 100 m/hr. So here we go. When that metric-length of 100 miles gets expanded to two hundred miles, the energy responsible for expansion will still take the same time period (one hour) to travel the same, now expanded, metric, which now has a length of 200 miles. So the speed of expansion will now be 200 m/hr even if the energy’s celerity is invariant. Consequently, expansion will accelerates its “speed”. But there’s no need, at all, for “dark energy” to explain this “fact”. Increased space metric by expansion does it clearly enough. And then, again, you could say: "If the period of time wouldn't change, then the frequency wouldn't change". And you would be right. But, as we saw, the frequency changes only while coming thru our own "altered space" (galaxy's, solar's and Earth's); while in outer space, it adapts to its metric-length. Conclusion: dark energy as well as dark matter are completely irrelevant in the story of the universe. Since, probably, many of you perceived a great difference in the kind of opinions I posted in the previous first pages of this discussion and the kind I posted recently, I have to confess that what I’m posting these days are ideas that come up to my “free wandering” mind. This means that I actually don’t know if what I’m saying is exact or not, contrary to when I was talking about gravitation. I admit that this is the way my mind works. I let it go freely and then analyse what came up from the “trek”. What I mean is that my last post was a logical result of certain “facts” that came as results following descriptions on consequences of my opinion with gravitation. But I’ve crossed, a long way, over the line of what is explained by actual experimentation's interpretations regarding electromagnetic wavelength, at least. How is it possible that on the surface of the Earth, we can observe a “gamma ray” which has a 10^-14 m wavelength? This “fact” destroys completely the results shown on my drawing; because the space metric on the surface of the Earth cannot be of 10^-14 m.
So what is the answer? Or what would be the explanation? If I cannot find a solution to this problem, it means that gravitation IS NOT the result of decreasing metric of space altering a definite volume of space. It would also mean that electromagnetic waves do not adapt to the space metric it is traveling through; and that, definitely, doesn’t make sense at all. So, I guess I’m stuck, and I might as well come back to accept that masses attract themselves, that dark matter exists and so does dark energy, the four fundamental forces, gravitons and Higgs bosons plus, whatever is imagined in the future to evade discrepancies with accepted past interpretations. But…I can’t accept it! Sorry. So what am I missing regarding electromagnetic waves? I forgot that electromagnetic waves do not travel through space because they have light-speed. Which means that all wavelengths exist at the same time wherever we observe one of them. Which is a consequence of the "fact" that light-speed erases distances and freezes time. So whatever electromagnetic wave we “capture”, we get the whole evolution story of electromagnetic waves. Nice to imply; but is this view acceptable? I think it could be, because we observe this kind of situation even at the material level. For example; when biology describes a human body while making researches, it can describe the whole evolution of that body starting at its DNA. So the whole evolution “story” is present in the actual body they’re working on. The same thing applies in geology. Scientists observe the whole evolution of landscape or rocks. The only difference is that those events regarding each “stories”, did not happen “simultaneously”, as it did with electromagnetic waves; because these events didn’t proceed at light-speed. Is that the answer to my problem? I’ll have to re-check. But if it is the right answer, I’ll have to admit that when considering the universe as a “whole”, it is existing as a single unity, in a status of “ever present” without any “distances”. Which is quite a “singularity”. And this pulls me back to the description of the single evolution process possible; which is to take a “potentiality” and transform it in a “reality”. If the original potentiality is a “probable singularity”, its realization would definitively be a “real singularity”. -What about the second point you say that you missed? I forgot that the basic metric of space is 10^-35 meter and that it cannot expand and has to duplicate. So, naturally, we can observe all electromagnetic wavelength from when they started at 10^-14 m, since they can be observed as duplication in all metric we choose to observe. So the result is the same as in my previous explanation. Let’s go a bit further. -Why would you want to do that? I confess that this was another opinion my roaming mind gave me. And even though it’s based on general assumptions resulting from experiments, I cannot consider it as a “fact” for now. In order to be a “fact”, I would have to define the exact “nature” of electrons; not only its actions. So what could be an electron cloud? Here we have a nucleus surrounded by five different energetic electron clouds. The difference in energy is represented by the gradual decreasing of shades of each clouds. What we know is that an electron cloud is a volume of “negative” energy. Nice to say but we’ll have to find what it really means. What we also know is that this “negative” energy was first singularized (created) by collisions of gamma rays. Furthermore, we know that there are three “generations” of electron clouds: Taus, Muons and finally, Electrons. In addition to all this, we know that these “negative” energy volumes first appeared after the “birth” of the Bottom quarks, if we stick to the mass energy chronology. Which means that gamma rays didn’t collide before Bottom quarks appeared. In fact, Taus and Muons would have appeared between Bottom and Charmed quark’s apparition, and electrons between the appearance of the Charmed and the Strange quarks. 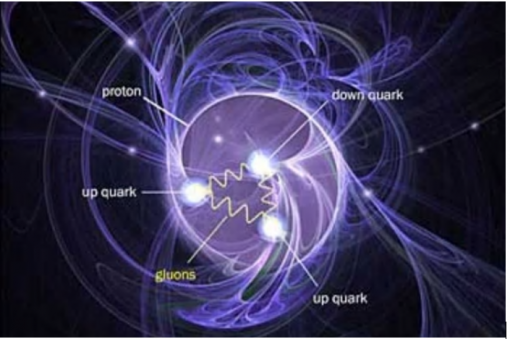 As for gamma rays, they are the most energized photons and officially come from nucleus decay; but we just saw that they come right after the Top quarks decay which gave us their “nature” (in the following drawing the quarks should be Bottom quarks). We saw that gamma rays were “vibrations” (waves) produced in the space “tissue” (in fact they are space metric vibrations). One surprising characteristic they have is that, unlike optical light and X-rays, gamma rays cannot be captured and reflected by a mirror. Their high energy photons pass right through them; in fact I think it’s because of their high frequency; their "up and down motion" doesn’t encounter any “blocking” in their "confined" metric level. It might be important to know that when a gamma ray strikes an electron, it loses energy. There should be a logical reason to this, and we might find it; who knows? But one thing is certain: if the gamma rays loses energy, either the electron (cloud) gains some or a neutrino is ejected. Officially, gamma rays are produced during gamma decay, which normally occurs after other forms of decay occur, such as alpha (expulsion of a helium nucleus) or beta (expulsion of an electron or positron with accompanying neutrino) decay. An excited nucleus can decay by the emission of an alpha or beta particle. The daughter nucleus that results is usually left in an excited state. It can then decay to a lower energy state by emitting a gamma ray photon, in a process called gamma decay. Gamma decay is also a mode of relaxation of many excited states of atomic nuclei following other types of radioactive decay. As we can see, the official knowledge is based on the aftermath apparition of Gamma rays. So we must put it aside for the moment. So where do those electron clouds come from, and what are they really? And furthermore; what is the process of their “creation”? So what could come out from such a collision? We see that a gamma ray represents an up and down motion (vibration creating a wave). Colliding two such “up and down motions” should disintegrate the rays and separate those two motions. In the case where both gamma rays have the same energy (whatever way we consider the “structure” of gamma rays on our drawing, it always imply kinetic energy; up, down and forward), the result has to be a complete “stop” of the gamma ray's forward trajectory. But the two composing motions of the gamma rays do not stop since those up and down motions do not collide one another. So those two “up and down motions” keeps on moving in a “blocked” volume of “space” that doesn’t travel anymore. And one motion being the contrary of the other one, the result gives a volume of “negative” energy plus a volume of “positive” energy. Meaning an electron and a positron. In fact I suggest a Tau and an anti-tau “particle”. It is important to keep in mind that what we are seeing here, is strictly two volumes of “circular motion” produced by the blocking of the "gamma ray's" trajectory of their “up and down motions"; in other words, two volumes of contrary “rotating” kinetic energy. Which would be the “nature” of an electron (or positron) and confirms that an electron is a fundamental “energetic particle”, but is not at all, “matter”. But since this energy is confined in a space volume, this volume has “mass energy” that is not directed toward a center of gravity as in the case with quarks; which is the reason why it gives it a lot less impact on metric expansion or rather, I should say, they have a more "diluted" impact on it. This absence of center of gravity is simply because there was none existing in the original gamma rays. So how does that fit in our actual science knowledge? What we know officially is that when gamma rays collide they will create a pair that consists of an electron and a positron (an anti-electron); and if one "ray" has more energy then the other, that surplus of energy will be turned into kinetic energy expressed by an escaping half spin energized neutrino (which to us is free kinetic energy expression). But then, what do we know about electrons? 2) Neutral leptons, better known as neutrinos. Both electrons and neutrinos have a half spin just as quarks do; which is normal since they originated from a half-spin Bottom quarks. Charged leptons can combine with other particles to form composite particles called atoms, while neutrinos rarely interact with anything. So it looks like I can now consider my opinion on the “nature” of an electron as a “fact”. We can also begin to understand the relation between + or - charged particles, versus neutral charge particles even though they have the same half-spin. On the other hand, we cannot affirm that electron clouds are not subjected to gravitational effect (officially considered as strong interaction) since when producing hydrogen an electron cloud is captured and confined inside the volume of a specific metric of “altered space” around a proton. And this, even if an electron cloud doesn’t have a center of gravity. That is probably one of the reasons they distribute themselves on gravitational levels in regard to their energy versus the space metric involved. So this would then be the starting point for studying the production “process” of the different elements (atoms) of the periodic table in view of atom’s shells. Looks like we’re not out of questions yet. To resume everything we’ve seen so far, we found out that everything we observe today is simply kinetic energy that first manifested itself at light-speed, in a metric of 10^-35 meter and “travelled” through succeeding duplication (at a bit less than light-speed) of that basic metric, which produced different distances, that can be used today as “metrics” for measurements (foot, mile, lightyear, megaparsec etc.). 3) Specific small volumes of rotating motion (electronic clouds). 4) And liberation of surplus of energy into small quantum of energy of our number 1, called photons. And this is what composes the basics of our actual universe. a) The simple fact that when the number 2 (mass energy), having a volume of 10^-35 meter, appeared in our universe when it had attained a volume of 10^-15 meter, determined a portion of “altered space” around this newly appeared kinetic volume (difference between 10^-15 meter and 10^-35 meter). b) Duplication of number 1 continued normally “creating” flat space, which gradually separated volumes of “altered space” one from another, without any other alteration than becoming an electromagnetic universe. c) The events that followed were occasioned solely by reactions of those volumes of “altered space” with each other’s, gradually accumulating more and more "mass energy" by accretion. Finally, it’s pretty simple; isn’t it? Sometimes I think that drawings explain things better than maths; but then, I’m no good at advanced maths. Which doesn’t prevent my mind from roaming as you already observed. Nevertheless, when we look at the possible disposition of positive protons in order to prevent repulsion by their positive charges, we find interesting indications on the stability of an atom. Let’s look at the most stable, and numerous atoms in the universe, of the periodic table. 2) Proton and neutron are specific pre-matter particles while electrons are volumes of rotating energy. With helium, we can see that protons and neutrons are attached to a mutual center of gravity but the positive charges are not in contact, which prevents repulsion of charges. In other word, accretion of nucleus particles was performed by gravitational effect. So normally, “pressure” should be manifested on this center of gravity. In the helium drawing, we can understand that the excess of neutral neutron’s mass energy, pressing one against the other, prevents access for each positive charges of the less massive protons. We can also see that the tendency from the more massive neutrons to take possession of the center of gravity (they both fall toward it) makes the nucleus rotate. This isotope is stable and thus has no decay products. When we get to the third most stable element of the periodic table, lithium 7, we see the same necessity for neutrons to prevent the contact of proton’s positive charges. But we find that the “nature” of the atom has change. We now have a metal instead of a gas. Contrary to helium 4 where stability was gained by equal numbers of protons and neutrons in the nucleus, in this metal element, stability is procured by an added neutron to the number of protons, because of the disposition needed to avoid positive charge contacts. So the stability of an atom is not guaranteed by equal numbers of protons and neutrons in the nucleus; equal numbers of protons and neutrons only defines or confirms the nature of the element; not its stability. 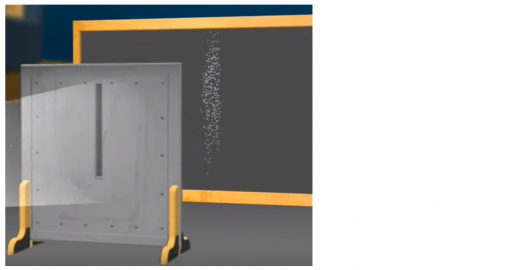 Furthermore, we can see that the needed disposition of neutrons in this metal demands that a neutron takes access to the center of gravity of the atom. The question become: Does that fact could prevent the nucleus from rotating? I don’t have the answer for now. Lithium third lonely electron (in the second shell) is high energetic like H and Na electrons, and come easy to other protons for bonds creation (if you keep considering “forces”). But in the absence of forces, it seems that the two electrons of the first shell push away the single electron thus creating a new “shell” or a new “energetic level”. The question is: why is that new “shell” more energetic than the previous shell? The answer could be because when the new arriving proton/neutron install themselves inside the previous nucleus (helium), their electron cloud isn’t pushed at all but has to surround the already existing energetic defined electron cloud, installing itself farther away from its previous hold of center of gravity. This could enable it to manifest more energy (orbit faster); and that would explain the gradual energetic increase of surrounding shells. Another question arises also. We know that helium, carbon, nitrogen and oxygen nuclei weighs less than the sum of the weights of their components. In fact what we are talking about here is “mass” and not “weight”. So it seems that the mass of components sums more than the mass of the atom’s nucleus. But is this a “fact”? It might look like it. For example, one carbon nucleus is slightly lighter than three helium nuclei, which can combine to make a carbon nucleus. This illustrates what is called the mass defect. But that defection is simply caused by maths and would be explained a lot simpler by considering “pressure” on the center of gravity of each atoms. Space metric “increases” gradually; so there has to be a difference if you had the decreased metric of three helium atoms and compare the sum to the decreased metric of one single carbon atom. The added metrics of three cannot be equivalent to the single one. 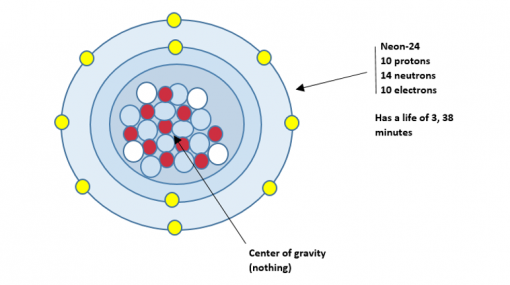 There’s evidently as much pressure on the gravity center of a carbon atoms than on the center of gravity of three helium atoms, since there’s as much pressure made by 6 protons plus 6 neutrons, than the sum pressure made by three groups of 2 protons and 2 neutrons. But one is made on a single center of gravity while the other is divided on three center of gravity. In other words, the single center of gravity is push further back in the space metric of a carbon atom than in the space metric of any helium atom; so since metric increases gradually, you get less extended metric in a carbon atom than three added metrics of helium atoms. We can see that adding the mass energy of three helium atoms doesn’t mean anything as far as the metric, defined by mass energy, is concerned. As for mass defect, it’s more like a volume defect, if we compare the farther attained metric of carbon to the farther attained metric of helium. Helium’s attained metric is greater than carbon’s attained metric; and since helium appeared before carbon there’s no discrepancy in these facts. I suspect that analyzing the differences might give us hints on the structure of “altered space”. That’s something to look into some day. But there also exists a notion called “mass excess”. So what does this means? The “mass excess” of a nuclide is the difference between its actual mass and its mass number in atomic mass units. And the atomic mass unit is a standard unit of mass defined as one twelfth of the mass of an unbound neutral atom of carbon-12. So this concept is also irrelevant for us as to the effect of mass energy on metric is concerned. The reality is that the pressure on the center of gravity of an atom is what defines the amount and intensity of “altered space” around the atom; and that “pressure” is cause by “mass energy”. As for the next element, Beryllium, we can see that the neutrons install themselves again to prevent contact between positive protons. Regarding the second energetic shell of Beryllium, we observe that the electron cloud might be augmented in energy by an added electron cloud; but I rather think that it gets simply added surface covering from both clouds since the shell's energy is already defined by the distance to the center of gravity. This would normally give more "space" for installing other electron clouds. 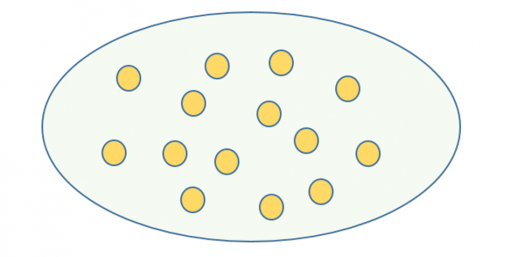 It is evident than the space occupied by the second shell is greater than the space occupied by the first shell; so if an electron cloud is "volume defined" you can put more clouds in the second shell than in the first shell. In my next post we will continue the investigation on stable elements of the periodic table. Here is a note just in case it might become important: So far, the center of gravity of a metallic atom is occupied by a neutron. I forgot to mention that packing protons and neutrons in the nucleus gives approximately the same total size result as packing hard spheres of a constant size (like marbles) into a tight spherical or almost spherical bag. ; So our actual drawings are adequate. 1) Neutron occupying that center (for metal) like Lithium and Beryllium. 2) Neither occupying that center like we saw with the first real atom gas we met: Helium-4. 3) Which leaves a Proton occupying that center for non-metal (except for Hydrogen gas; but Deuterium’s center is not occupied). But when I took note of it, I had already made the drawing of all following elements and things weren’t working as simple as I would have suspected; so I had to start all over again. Let’s add some notions to our knowledge. I don’t have to say that I won’t memorize everything. I take care to leave space in my mind for "facts" instead of "interpretations" which I usually do by myself. A “free radical” is an atom molecule, or ion that has an unpaired valence electron; so as we can see the Boron is a free radical atom. We also see that in order to dispose neutrons to prevent positive repulsion of protons, we remain with a “halo type” of proton (orbiting the nucleus periphery) which is not confirmed yet by researchers for Boron. As we can also remark, there was enough “space”, created by the distance of that shell from the center of gravity of the atom, to install one and more successive electron cloud energies in the second shell. 5) Boron-8 is the atom that has the longest boron-half-life (770 milliseconds). All other isotopes have half-lives shorter than 17.35 ms, with the least stable isotope being 7B, with a half-life of 150 yoctoseconds (ys). Those isotopes, with mass below mass number 10 (like our Boron-8), decay into helium (via short-lived isotopes of beryllium for 7B and 9B) while those with mass above mass number 11 (by added neutrons) mostly become carbon. Boron-10 would be the Boron atom (equal number of Protons and Neutrons). It is stable (doesn’t decay) and so is its next isotope Boron-11. Boron is produced entirely by cosmic ray spallation and supernovae and not by stellar nucleosynthesis. It follows Beryllium because it has an added proton but isotope Boron-8 has three neutrons instead of five (which makes the stable Boron-10 the atom), or six (which makes the other Boron-11 isotope stable). Elemental boron has been found in star dust and meteorites but does not exist in the high oxygen environment of Earth. Boron is essential to life. Small amounts of boron compounds play a strengthening role in the cell walls of all plants, making boron a necessary plant nutrient. Boron is involved in the metabolism of calcium in both plants and animals. It is considered an essential nutrient for humans, and boron deficiency is implicated in osteoporosis. Boron is capable to form stable covalently bonded molecular networks because of the possibility to integrate electron cloud energies of other atoms or isotopes, in its valence shell (outer shell) which then becomes “co-valent”. Elemental boron is rare and poorly studied because the pure material is extremely difficult to prepare. Boron does not react with air at room temperature, but at higher temperatures it burns to form boron trioxide. As a metalloid, we installed a neutron at its center of gravity. 6) Carbon-12 is created in stars. Carbon-12 is use as the standard from which atomic masses of all nuclides are measured: its mass number is 12 and contains 6 protons, 6 neutrons surrounded by two shells containing respectively 2 and 4 electron cloud energies. The Hoyle state is an excited, spinless, resonant state of carbon-12. It is produced via the triple-alpha process. The existence of the Hoyle state (Fred Hoyle in 1954) is essential for the nucleosynthesis of carbon in helium-burning red giant stars, and predicts an amount of carbon production in a stellar environment which matches observations. The existence of the Hoyle state has been confirmed experimentally, but its precise properties are still being investigated. Carbon is the fourth most abundant element in the universe after hydrogen, helium, and oxygen. Carbon's abundance, its unique diversity of organic compounds, and its unusual ability to form polymers at the temperatures commonly encountered on Earth, enables this element to serve as a common element of all known life. It is the second most abundant element in the human body (about 18.5%) after oxygen. The atoms of carbon can bond together in different ways (allotropy) due to its valence shell. For example, the allotropes of carbon include diamond (where the carbon atoms are bonded together in a tetrahedral lattice arrangement), graphite (where the carbon atoms are bonded together in sheets of a hexagonal lattice), graphene (single sheets of graphite), and fullerenes (where the carbon atoms are bonded together in spherical, tubular, or ellipsoidal formations). The term allotropy is used for elements only, not for compounds. The change between allotropic forms is triggered by the same forces (why use the word “force” when it’s a “process”; I wonder?) that affect other structures, i.e. pressure, light, and temperature. Carbon has the most allotropes. Being a non-metal, we installed a Proton on its center of gravity. 7) Nitrogen-14 makes about 99.636% of natural nitrogen. Nitrogen-14 is one of the very few stable nuclides with both an odd number of protons and of neutrons (seven each). Each of these contributes a nuclear spin of plus or minus spin 1/2, giving the nucleus a total magnetic spin of one (I’m wondering if a zero spin nucleus, rotates?). Like all elements heavier than lithium, the original source of nitrogen-14 and nitrogen-15 in the Universe is believed to be stellar nucleosynthesis, where they are produced as part of the carbon-nitrogen-oxygen cycle. Nitrogen-15 is a rare stable isotope of nitrogen (it has one more neutron than Nitrogen-14). Two sources of nitrogen-15 are the positron emission of oxygen-15 (which should be equivalent to injection of an electron) and the beta decay of carbon-15 (ejection of an energetic electron which should be the same as injecting a positron). Nitrogen-15 presents one of the lowest thermal neutron capture cross sections of all isotopes. Being a gas, no particle occupy its center of gravity on our drawing. 8) Oxygen-16 is a stable “isotope” (atom) of oxygen, having 8 neutrons and 8 protons in its nucleus (once again when we have equal numbers of protons and neutrons we don’t have an isotope; we have an atom). It has a mass of 15.99491461956 u. Oxygen-16 is the most abundant of oxygen atoms and accounts for 99.762% of oxygen's natural abundance. This is because it is a principal product of stellar evolution and because it is a primordial atom, meaning it can be made by stars that were initially composed exclusively of hydrogen. Surprisingly Oxygen is not a gas but is a non-metal; so we installed a Proton at its center of gravity. Its atomic number is 8 which tells us that the atomic number consists of the number of protons in a nucleus. Oxygen is the third-most abundant element in the universe, after hydrogen and helium. 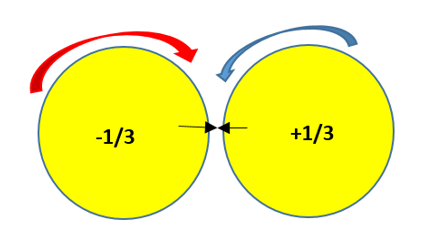 Since the valence shell (outer shell) can take two more electron cloud energies, two oxygen atoms can “merge” within a co-valence shell. This produces a molecule called Dioxygen. This is an important part of the atmosphere and diatomic oxygen gas constitutes 20.8% of the Earth’s atmosphere. Many major classes of organic molecules in living organisms contain oxygen. Most of the mass of living organisms is oxygen as a component of water, the major constituent of lifeforms. 9) fluorine-19 is the only isotope that is stable (doesn’t decay) but the longest life goes to the atom itself, Fluorine-18, with a half-life of 109.771 minutes. All other isotopes have half-lives under a minute, the majority under a second. Fluorine-19 is a “Nuclear magnetic resonance –active” isotope with a spin of ½. Nuclear magnetic resonance (NMR) is a physical phenomenon in which nuclei in a magnetic field absorb and re-emit electromagnetic radiation. This energy is at a specific resonance frequency which depends on the strength of the magnetic field and the magnetic properties of the isotope of the atoms; in practical applications, the frequency is similar to VHF and UHF. A key feature of NMR is that the resonance frequency of a particular substance is directly proportional to the strength of the applied magnetic field. All isotopes that contain an odd number of protons and/or neutrons have an intrinsic magnetic moment and angular momentum, in other words a nonzero spin, while all nuclides with even numbers of both have a total spin of zero. All nucleons, that is neutrons and protons, composing any atomic nucleus, have the intrinsic quantum property of spin. The overall spin of the nucleus is determined by the spin quantum number S. If the numbers of both the protons and neutrons in a given nuclide are even then S = 0, i.e. there is no overall spin. Then, just as electrons pair up in atomic orbitals, so do even numbers of protons or even numbers of neutrons, (both of which are also spin 1/2 particles and hence fermions) pair up giving zero overall spin. Such nuclides do not exhibit any NMR absorption spectra. However, a proton and neutron will have lower energy when their spins are parallel. The lowering of energy for parallel spins has to do with the quark structure of these two nucleons. A non-zero spin is thus always associated with a non-zero magnetic moment. It is this magnetic moment that allows the observation of NMR absorption spectra caused by transitions between nuclear spin levels. I’m sorry but that doesn’t make sense at all. Stability of an atom should mean a longer-lived atom since it doesn’t decay; like we observed in all cases since we saw the carbon atom (except Fluorine-19 which was stable (no decay) while Fluorine-18 had a half-life of 109. 771 minutes). So we’ll have to find the reason in regard to either gravitational effect or decreasing metric. Consequently we will stop adding notion to our knowledge until that problem is resolved. We’ll do that in the following post. It’s no use to continue if we can’t explain that problem. 1)I must correct myself; the Boron-8 isotope was confirmed has having a halo-type Proton in its nucleus. Sorry. Which means that I'll be able to continue. What makes a stable (non-decaying) atom? Before continuing with my drawing of Protons and Neutrons in nucleus volume, and because I spent a day working on an imaginary problem, I might as well do something with the result which gave me a surprise. Unstable Neon isotope: More Neutrons than Protons. It is obvious that the instability of an isotope is the consequence of the presence of a surplus of Neutrons in the nucleus. 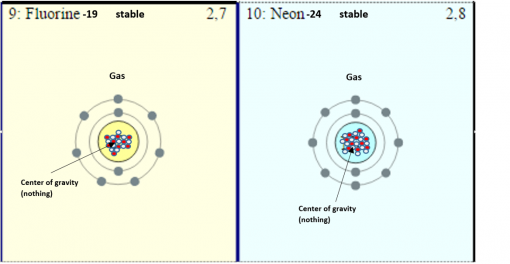 But how come, some nucleus remain “stable” even with added Neutrons; like for example the isotopes Neon-21 (one Neutron in surplus) and Neon-22 (2 Neutrons in surplus)? If we reach back to compare with primordial elements, we find that the Deuterium (1 Proton + 1 Neutron + 1 Electron) is stable until a second Neutron is added to the nucleus (producing Tritium) breaking the stability of the isotope and the nucleus becomes radioactive (unstable). Which is normal since the Neutron is personally unstable and is mass energy-wise stronger than a Proton. Which means it regresses metric more than a Proton (if ever the metric has something to do with the event). Has for the next element to Deuterium, only helium-3 (2 protons + 1 Neutron) and helium-4 atom (2 Protons + 2 Neutrons) are stable out of its nine isotopes. Which confirms that, at this level, one more Neutron to an atom makes an unstable isotope (radioactive) while on more Proton (helium-3) doesn’t destabilize the isotope. 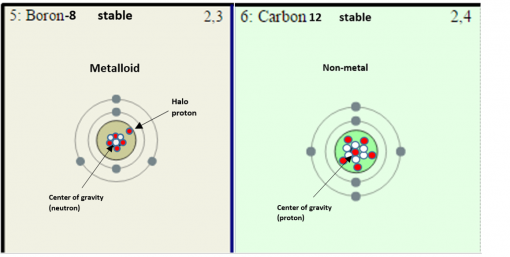 If we go further down the evolution path toward more protons in each nucleus, carbon for example, we have the same undefined limit that we saw with helium; 6 Protons can stand up to one added Neutron (C-13 is stable, C-14 is not). But when we reach the next element, Oxygen having 8 Protons, we find a surplus of two Neutrons in an isotope that stays stable. Which means that somewhere, between 7 Protons and 8 Protons, stands a “stabilization limit” for the presence of one Neutron versus two neutrons. And it’s at the next element that things get even more curious. Here, the unthinkable happens: the fluorine atom (9 Protons + 9 Neutrons + 9 Electrons) is UNSTABLE. This is the first unstable atom that exists on the periodic table. To gain stability, this atom has to add one Neutron. Which means that the metric regressed by Protons might also have an effect on the Neutron’s regressed metric. The only way this can be, is if protons, at this level, are more centered around the center of gravity than Neutrons; so their “pressure” is greater than further back Neutrons. Finally, this means that, on top of the “stabilization limit” we found in Oxygen for Neutrons, there is a similar “stabilization limit” in regard to Protons that stands somewhere after the Fluorine-18 atom and before the Fluorine-19 isotope. 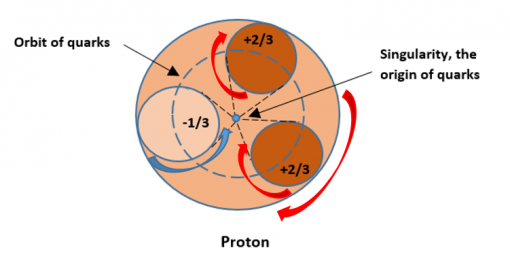 Since Proton’s mass energy is smaller than Neutron’s mass energy, and Proton’s stabilization limit is greater than the Neutron’s, it would mean that this power of stabilization of atoms could be inversely proportional to mass energy. Which means that the more pressure we get on the center of gravity of a particle, the more probability of ejection of energy we have. Which is rather normal since the pressure decreases the metric and pre-matter particles are volume defined. So this pre-matter particle has to liberate itself partially of its kinetic energy. Which, again, is exactly what a Neutron does when it transforms itself in a Proton by Beta decay (expelling an electron + an anti-neutrino). So the life-time of an isotope might be related to the energical intensity needed to be liberated depending of the metric it occupies. But this surplus energy has to accumulate to a certain level of intensity before being expelled. The more of pressure, the more this surplus energy would accumulate. Oxygen isotopes decays most commonly mode is βeta- decay (changes a Neutron to a Proton). Carbon-14 goes through radioactive beta decay by emitting an electron and an electron antineutrino (transforming a Neutron in a Proton), one of the neutrons in the carbon-14 atom decays to a proton and the carbon-14 decays into the stable (non-radioactive) isotope nitrogen-14. Fluorine-18 atom decays by positron emission 97% and/or electron capture 3% of the time (beta+ decay). Contrary to precedents elements, it changes a Proton into a Neutron to attain stability. Both modes of decay produces the previous stable oxygen-18. This would be an approach to analyze the events more deeply, I think. Anyway, normal nature events are fun and full of surprises. Since the gravitational effect is a decrease in metric of space, let’s consider the metric of space containing a nucleus to try to solve our problem. Each nucleus volume is the consequence of the gluon field effectiveness which extends at 10^-15 meter. So a nucleus has the size of 10^-15 meter. A nucleus is around 10,000 times smaller than the atom (if an atom is 19 miles in diameter, the nucleus will have a bit less than 10 feet in diameter. Which gives an idea of the volume of "altered space" around a nucleus) and is composed of Protons and Neutrons which are not “matter particles” but are “pre-matter” particles. Those “pre-matter” particles are "sphere shaped"; but nothing says that they regroup in a sphere. The fact we know is, that they are subjected to the space metric of their environment. Since a nucleus has a size 10^-15 meter, it is confined inside a metric of 10^-15 meter. Which means that all their components are also confined in the same metric size. Protons are pre-matter particles composed of three quarks particles attached to the center of gravity of the Proton (as we previously saw). The same structure goes for Neutrons. A nucleus is always incorporated in a gluon field; and we know that a gluon is a “surface” particle (bi-dimensional). So what would be the metric profile of that drawing? -It tells me that you don't have very much to do during the day. -Right; but nevertheless, I do quite a bit; don't I? First we have to take the “date” in consideration. It’s evident that when the Hydrogen appeared in the universe, the metric of “flat” universe had expanded quite a bit. But does it matter since “altered space” around Protons and Neutrons was not expanding? I doubt that it does; so one thing is settled. In the former drawing, we see the gluon active field metric of 10^-15 meter (no 1). Then we see (no 2) the result of the pressure of the proton’s mass energy, which holds back its center of gravity, decreasing the metric of its surrounding space. The portion of “altered space” around the Proton is what will “capture” an energetic electron cloud to “create” a Hydrogen atom. This doesn’t means that this portion of “altered space” already possess an energetic “identity”; it’s not energetic; it is only “altered space metric”. So this portion of “altered space” as to be compatible to the energy volume of the in-coming electron cloud. So what about that electron cloud that will be “captured”? The electron is a definite volume of rotating kinetic energy that produces a “mass energy” of 0.511 MeV. It is then, a definite intensity of kinetic energy. The ratio between the mass energy of a proton and that of an electron is about 1836 to one; and has held the same value for at least half the age of the universe. Electrons have a negative electric charge of 10^−19 coulomb. An electron is assumed to be a point particle with a point charge and no spatial extent; but the upper limit of the particle's radius would be 10^−22 meter. Meaning it has a “blurred” energetic volume (otherwise it wouldn’t have a radius). Electrons can jump from one energy level (shell) to another, but they can never have orbits with energies other than the allowed energy levels (shells). Which means that each orbit has its own energetic value. But we know that the “altered space” around an atom is not energetic; it is only specific metrics. So we should rather say that each shell has its metric value. We know that an electron behaves as a “wave”. Its “wave” characteristic has to have a wavelength and, never mentioned, but definitely a wave-height. And this wave-height has to “fit” inside a definite metric. Since the height of a wave defines the intensity of energy manifested (frequency), different wave-heights must adapt to different metrics. And we know that each shells around a nucleus possess different metrics which explains the necessity for electrons to adapt its wave-height (energy) to each shell’s metrics until the shell is energetically saturated (full). Furthermore, since the metric increases while being farther from the center of gravity of the nucleus, it’s normal that the energy level of each shells increases, permitting it to contain more and more electron clouds which have a definite energy. As you can see, we are approaching a clear vision or explanation for different energical levels (shells) of atoms. This post is, I think, the most important of all. So here is the latest on “gravitational effect”. This time we’ll go through it from A to Z, getting answers on every aspects. 1-We have an energized basic metric of 10^-35 meter that cannot increase because adding half of that metric is impossible, since it cannot exist. 2-The only solution to explain expansion that we observe, is duplication of the basic metric volume by the presence of its “inner” (proper) energy. So, how can it proceed? The three following drawings are what should represent a normal expanding space metric. 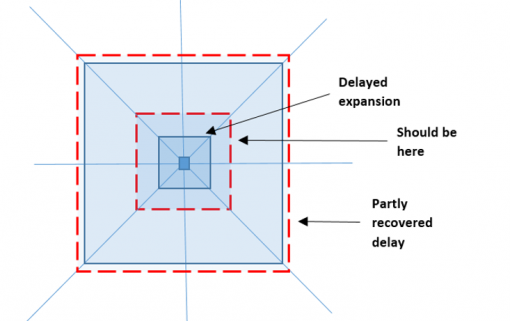 We can see that it simply “delays” (red dotted lines versus full blue lines) the expansion speed provoking an alteration on the topology of space. We can see the altered geodesic caused by the “delay” produced by the mass energy’s pressure on one sole metric point. The consequence is a gravitational effect. There’s no force involved and the “metric itself" possess no energy whatsoever; even though space has energy. And the same view as this one would be number 3. And this is what makes space topology “flat”; because whichever angle you consider you always get a straight line. 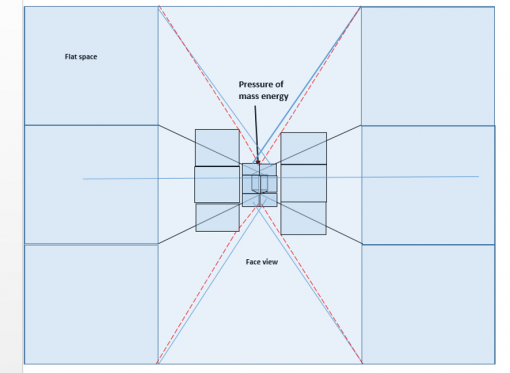 Now let’s see how mass energy’s pressure “alters” metrics of space. The red dotted lines are where the metric should be if it hadn’t been delayed by mass energy. 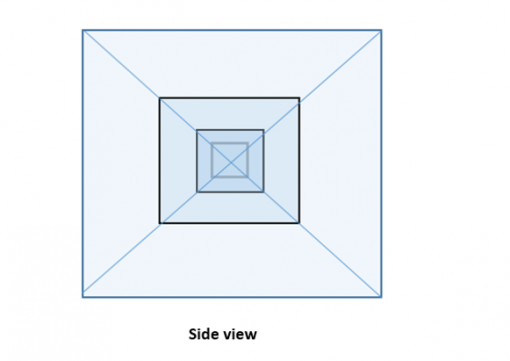 Like you can observe, it doesn’t “deform” space; the metric is still “square”. Which is normal since pressure comes evenly from all sides. We can also observe that since light-speed is an invariant, the altered space metric, after a certain distance, recovers its time delay. That is because, as the metric gets gradually farther away from the pressure point, its “inner energy” is gradually liberated, permitting it, after awhile, to re-express itself at the same intensity as “flat space” to which it, then, becomes equivalent ("after a certain distance" and "after awhile" suggest that distance and time are identical). Rocket B is oriented straight to the center of gravity so nothing will deviate its trajectory. As for rocket C, if nobody looked outside at the planet, they didn’t notice anything whatsoever. But Rocket A lived a different story. It’s evident that it “seemed” to gain speed while going through that volume of space, since the metric gradually shortens; but the reality is that it kept the same speed. The proof is that it came out at the same speed it had entered in the space volume. Let’s note rapidly that the sling shot “effect” used by satellites or rocket ships occurs when they approach behind a planet’s orbit. Because the speed of the planet is added to the rocket. 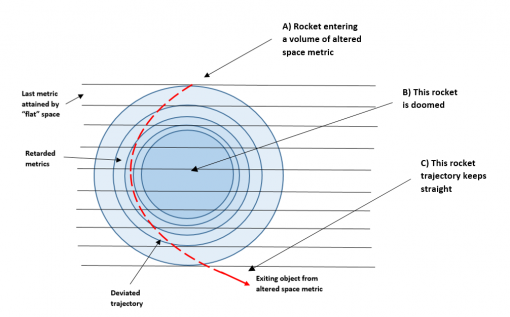 On the other hand, when they approach in front of the planet’s orbit, the speed of the planet gets subtracted from the object’s speed; so the rocket or satellite loses speed and doesn’t recover it coming out of the volume of “altered space metrics”. As you can see, the light source emits in all directions. 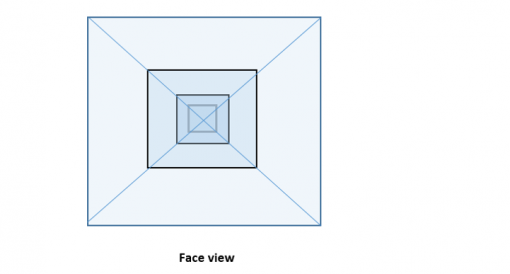 The light rays that are projected exactly toward the center of the "altered space volume" are lost. But the light rays that traverse the border metric of the volume of "altered space", are deviated toward the observer. The result is that the observer sees two images of the hidden source, behind whatever blocks the light rays projected directly toward him, instead of the source itself. 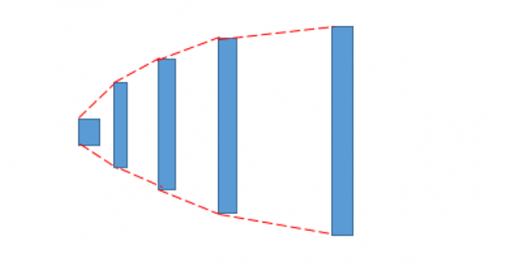 Note that if the observer is too close to the obstructive object, he will see a "light ring" circling the volume of "altered space", instead of two images of the light source. This ring is called a Einstein's ring. So I guess this sums up whatever is to be explained regarding “gravitational effect”. Beside the “fact” that volumes of space altered metrics are locate one inside the other as Russian dolls; but everybody knows that. So lf something else comes up, I’ll present it right away. But I'm still astonished that gravitation is a direct effect on time and leaves the effect on space as a consequence. If anybody needs clarifications, or doesn’t agree, they are welcome to participate, there’s no question about it; because that problem, at least in this forum, is surely solved.